Well, it has been a busy couple of weeks. 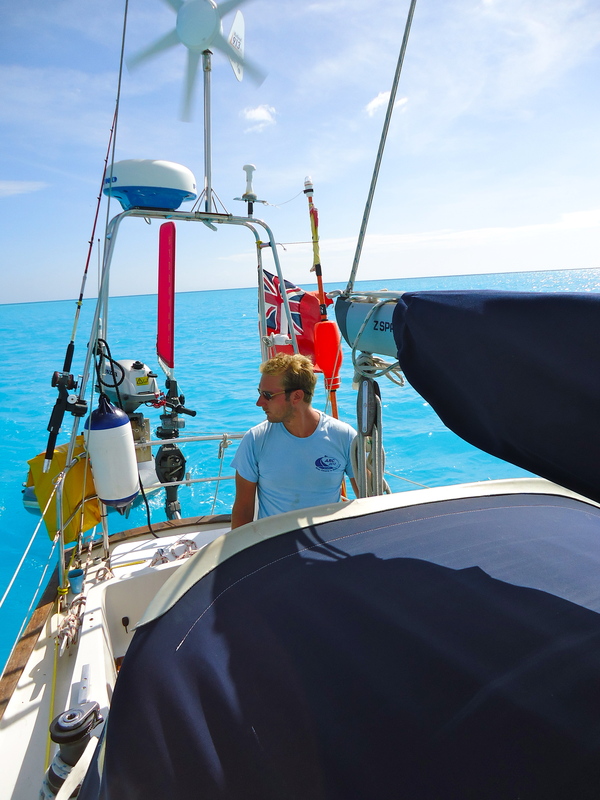 We headed back to Road Harbour shortly after the last blog to stock the boat up with food, water and fuel. 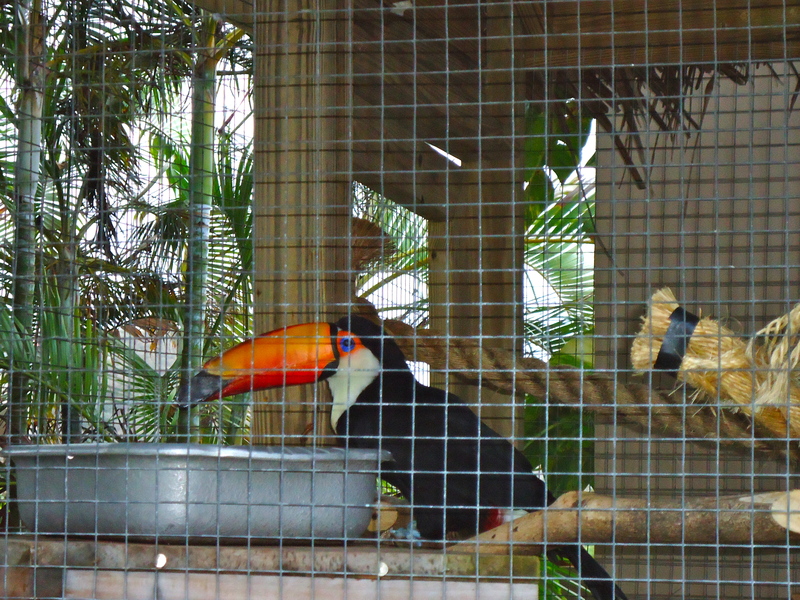 We were still with Rafiki and enjoying every moment of their company. 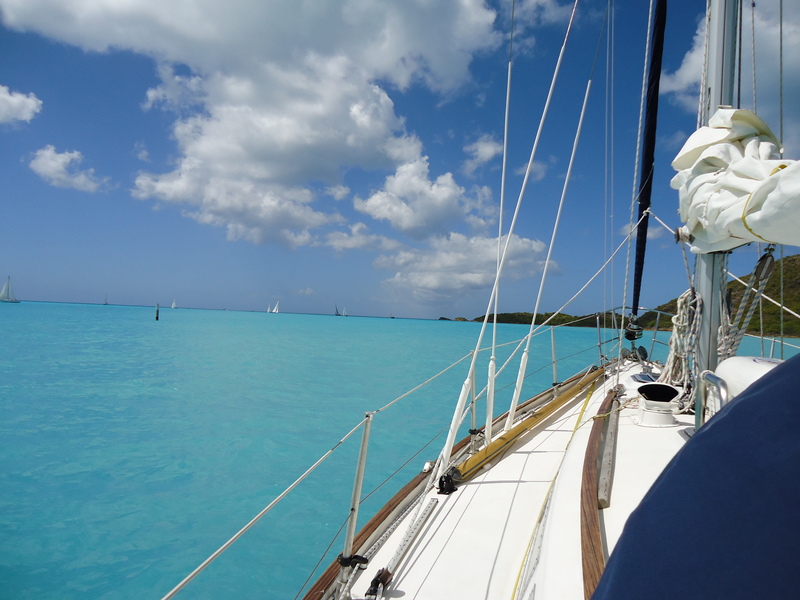 After a couple of days in Road Harbour we decided to both sail back to Dead mans Cay with Rafiki. We spent a glorious day there sipping tea with Calley and Rob and swimming with Emily and James. We saw the most amazing wildlife below the water and had an absolute shock when we saw a Spotted Black Stingray glide gracefully past us. Rafiki had to depart but we spent the evening enjoying the quite of Deadmans Cay. 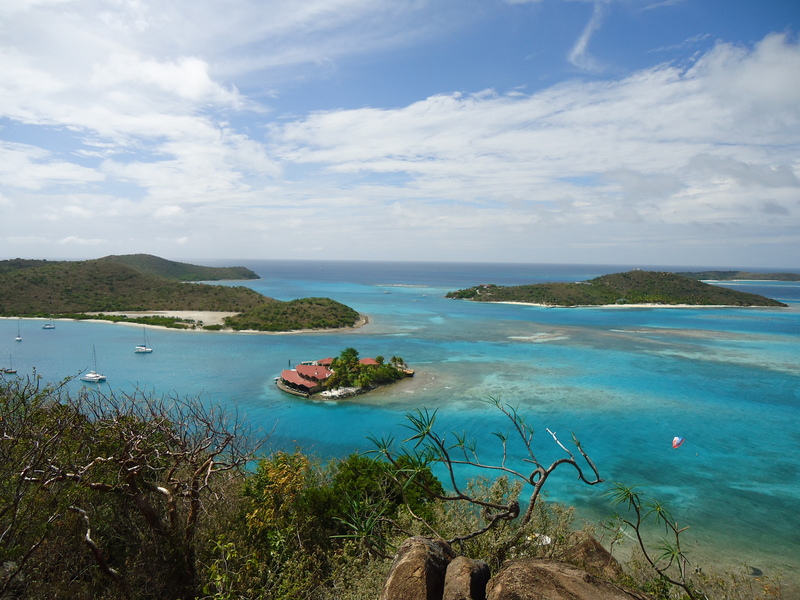 The next morning we headed to Norman Island, where the parties and beaches are meant to be the best around. We met up with another yacht called Fabiola and anchored next to them. When Rafiki arrived we all met on the beach for cocktails and lunch, kindly provided my Rafiki and Fabiola. In the afternoon Calley, Emily, James and their new crew member Andy took us to some caves just around the corner from the bay we were anchored inIt was a great day and Carlotta and I decided to finish off the evening by visiting an old schooner that has been converted into a bar/restaurant. The boat is called Willi T and the parties are said to be legendary. So off we went for a few drinks. As soon as we had sat down a couple of guys start naked decided to throw themselves of the stern, followed by another naked girl and and then 10 more. Apparently this is all part of the party and whoever jumps off naked gets a free T-shirt; we declined to take part on this occasion. 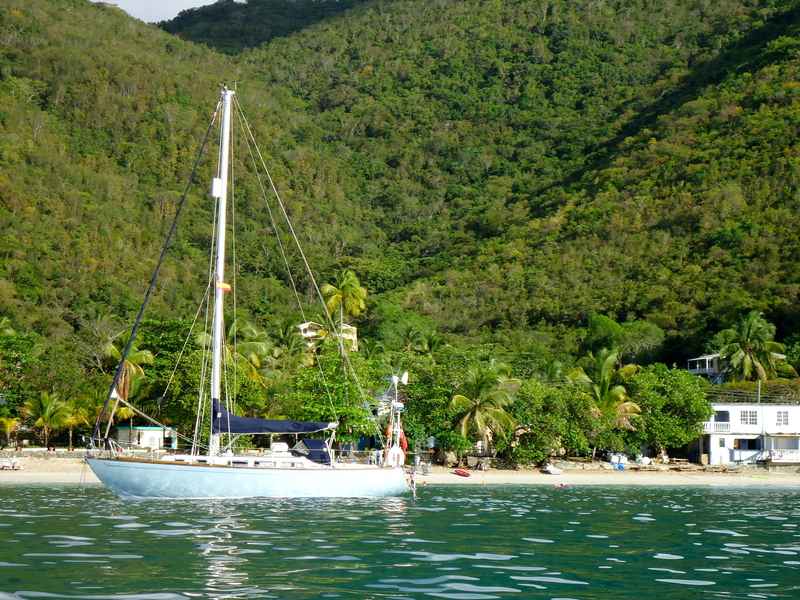 We set sail the next day heading for Gorda Sound. 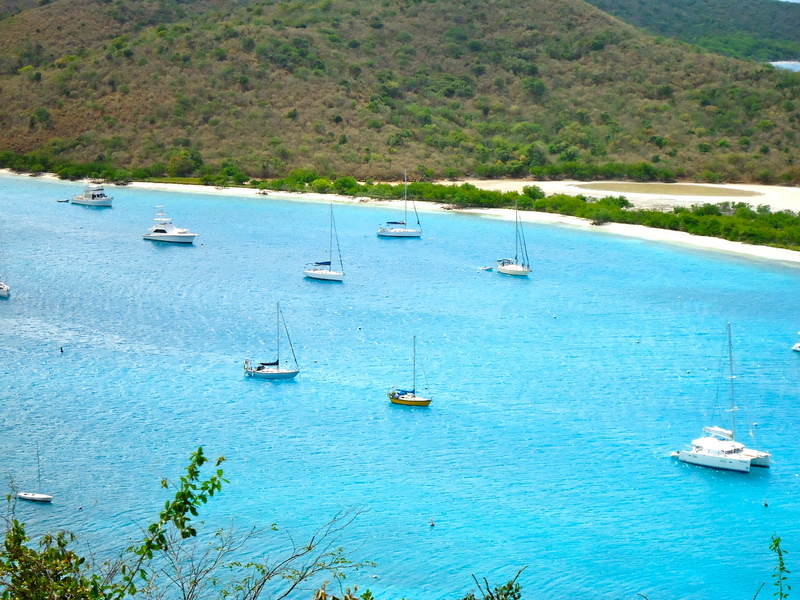 This is a beautiful spot situated on the north western side of Virgin Gorda. There we found paradise again. This is a huge protected bay. There are a few reefs to navigate when entering but once in you are clear of most dangers. We anchored briefly in Gun Creek to do some shopping and then to Biras Creek where we were to spend the night. Our main concern at this point was to make Happy Hour at Saba Rock, which is literally a rock with a small beach and an amazing bar/restaurant. We topped up with Painkiller Cocktails and had a great meal although service was not a strong point, thankfully the food was great. The next next day we sailed to Leverick Bay as this would be the departure point for Rafiki and the time for us to go our separate ways was fast approaching. We spent the day swimming in the resort swimming pool and after that we went aboard Rafiki and were treated to an amazing ‘fry-up’ before they had to leave. The time had come for Rafiki to leave us and what a sad occasion it was. We said our fair wells and amongst all the tears Rafiki departed into the sunset. We had met another yacht called Rufian, which is a Sadler 34. The lovely couple onboard are called Fiona and Ian and they invited us over for a fantastic Chilli. 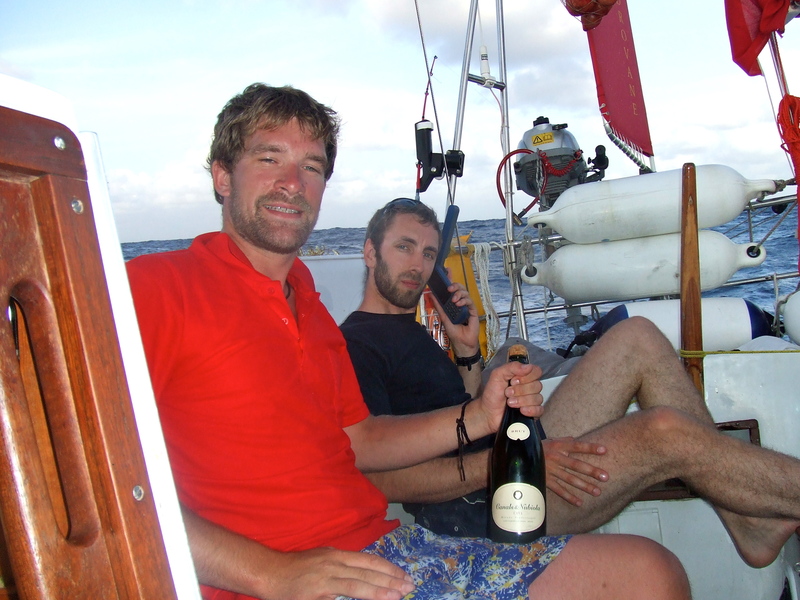 The following day we were surprised to come across our friends in Limbo who had sailed their 26 foot yacht from England to the BVI’s. 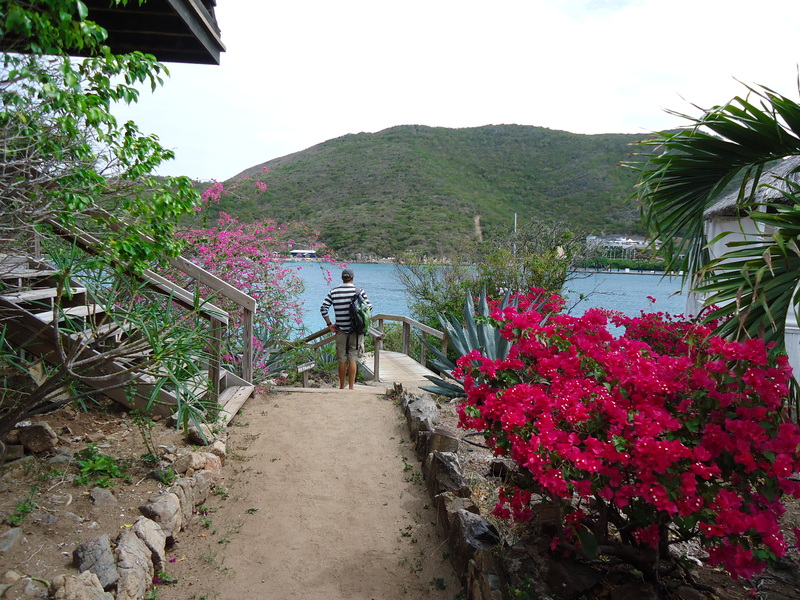 We all decided to go for a walk around Virgin Gorda and experience the pleasant views. 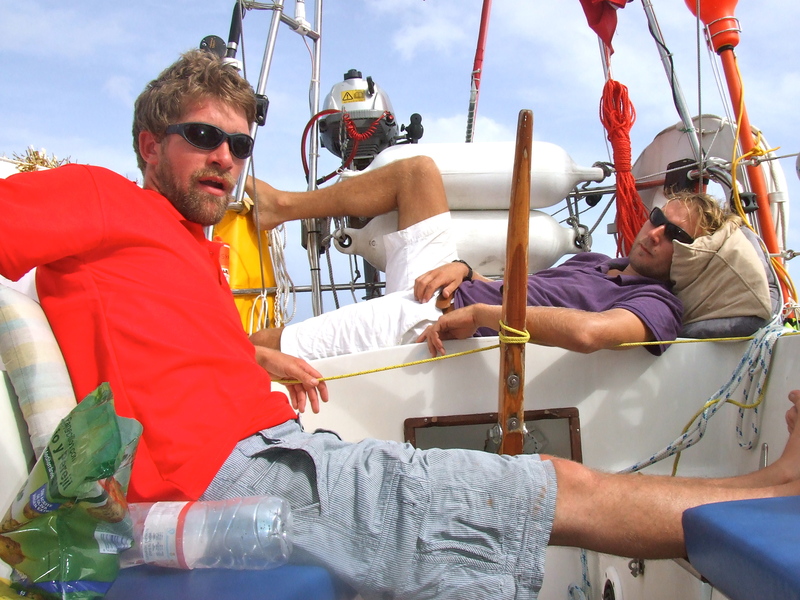 The next day Rufian had to depart and continue their passage up the East coast of America. 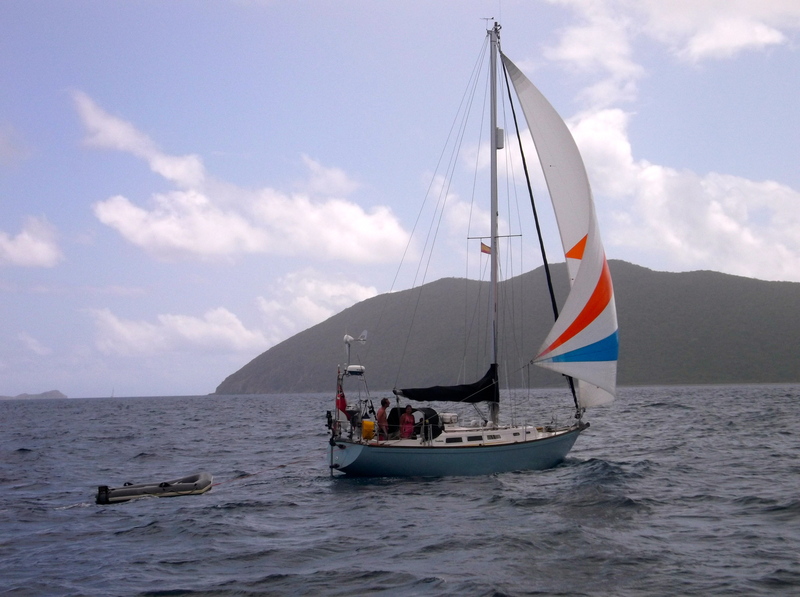 We sailed with Limbo down to Tortola as they have to have their boat shipped back to the UK although they would be staying with us for a few days before they catch their flight back to England. So, all was in order. 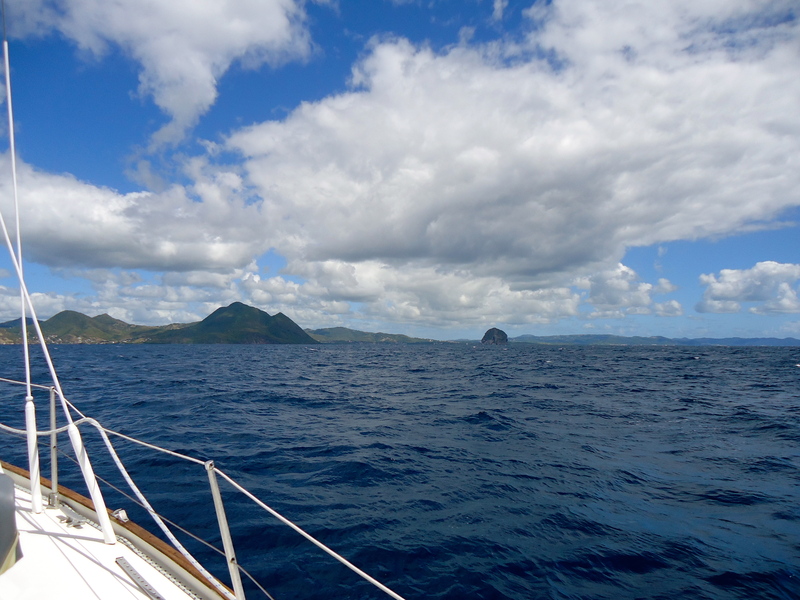 The wind had decreased and we were set to leave Marigot Bay for our sail to the British Virgin Islands where we would meet up with a friends onboard Rafiki. 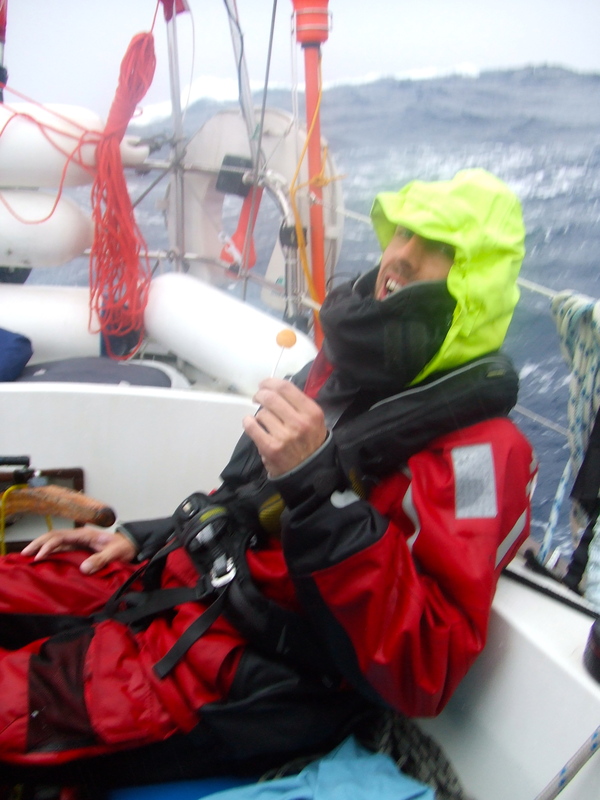 The journey was 80 miles and the winds favorable with a lovely Easterly pushing us from behind. We lifted anchor at 02:00 in the morning and sailed off into a full moon and calm sea. 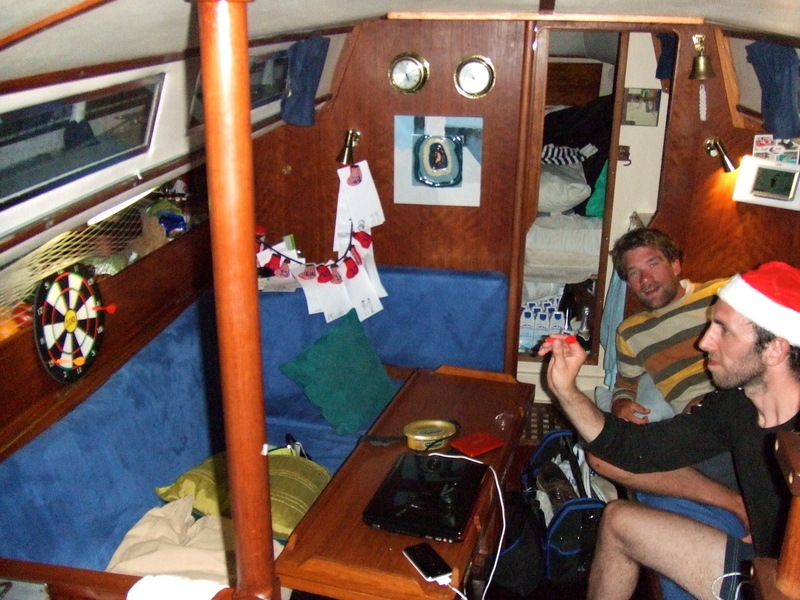 An hour into our sail we poled out the Genoa and I managed top get some sleep whilst Carlotta took on the first watch. 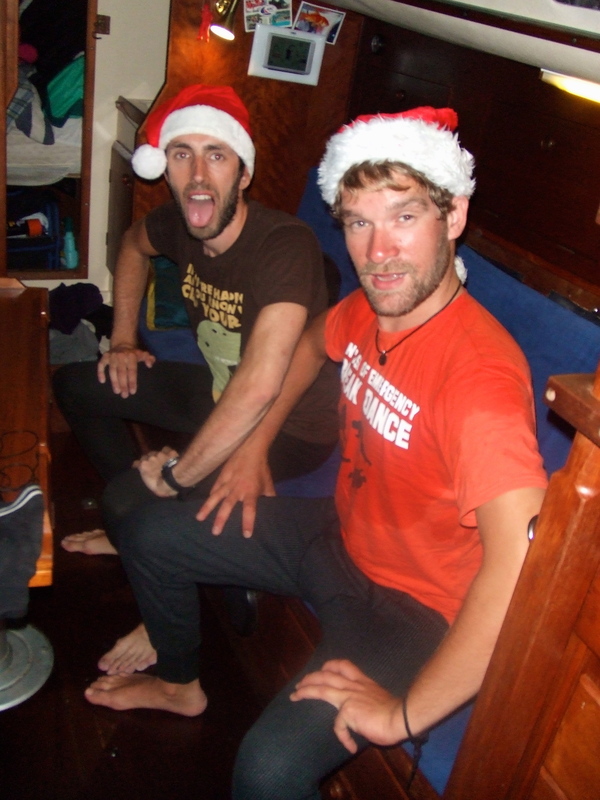 The journey was pretty uneventful, which is just what we needed after a few hard sails in previous weeks. 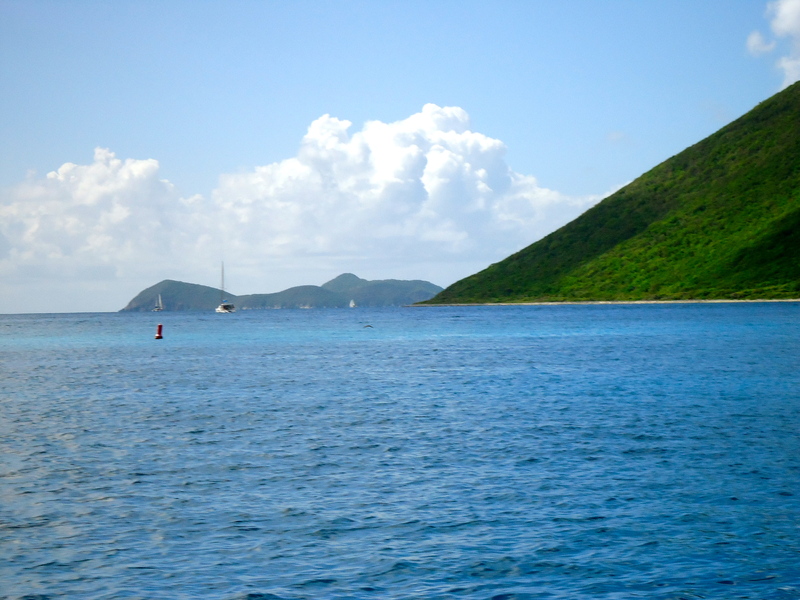 The journey took 15 hours to complete 83 miles, we were certainly not rushing and the winds went light as we approached Virgin Gorda; the first Island of the BVI’s. 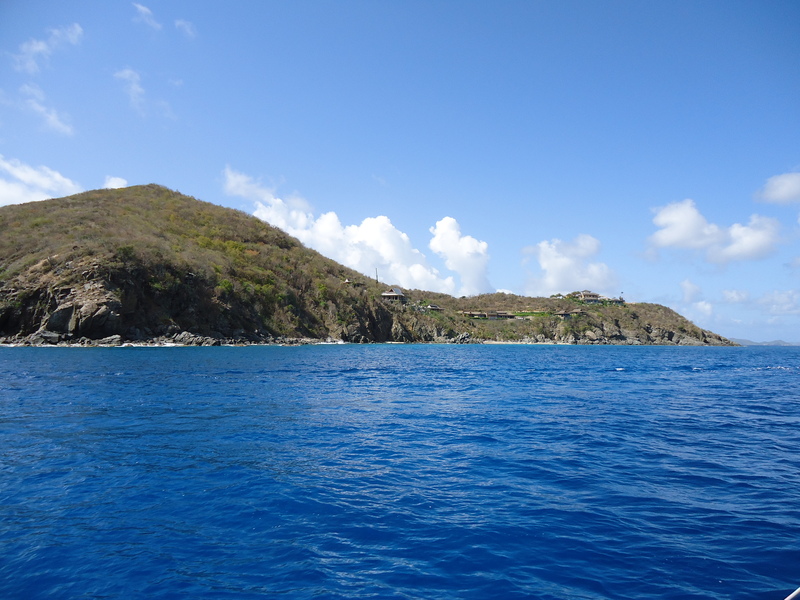 As we rounded Virgin Gorda and Ginger Island we were greeted into a new world of calm sees and stunning scenery. It was very much like enetering a forgotten world with islands doted around us in every direction and lush green mountains dropping down to golden sands below; it almost looked fake and nothing like what we had expected. 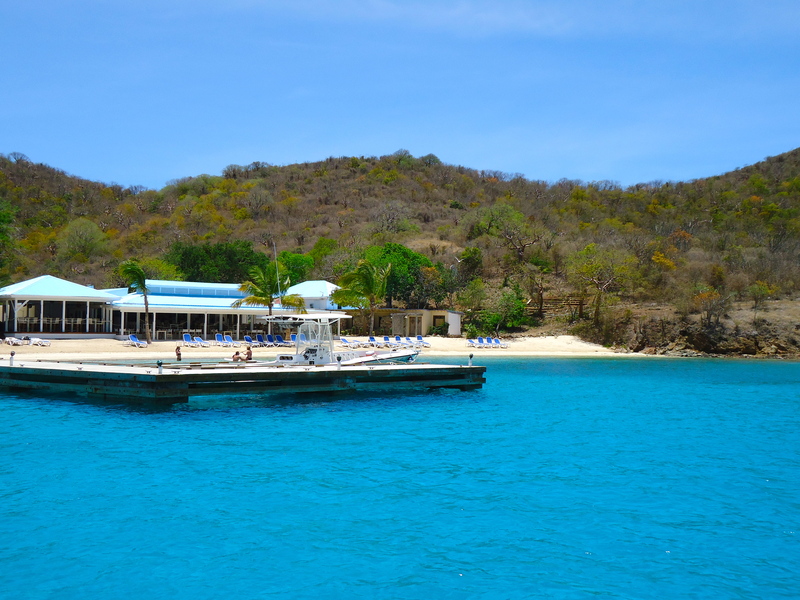 Our first stop would be Savannah Bay, which is located just North of Spanish Town, which is the main town in Virgin Gorda. We radioed Rafiki and let them know that we were approaching the reef-strewn bay. Kindly Rob and the children took to their dinghy and met us at the entrance to guide us into the bay, which was absolutely gorgeous. We had settled down and had dinner with Rob, Cally and the children whilst catching up on the past months events; it was so nice to be with friends again and to be surrounded by such bewildering beauty. 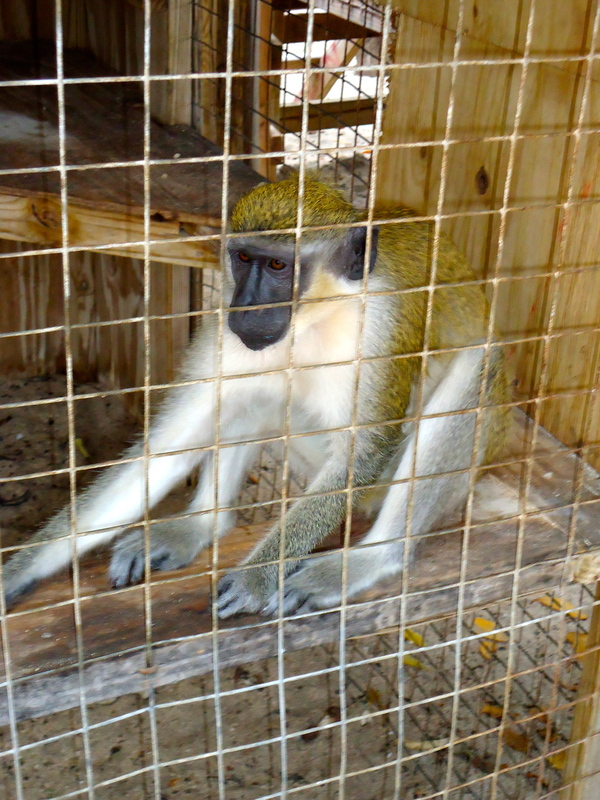 The next day we needed to check in so we sailed, or rather motored, to Spanish Town and whilst the Rafiki’s took the chance top victual along with Carlotta I began the process of filling out 4 different forms and being nicely questioned by several members of Customs & Immigration. 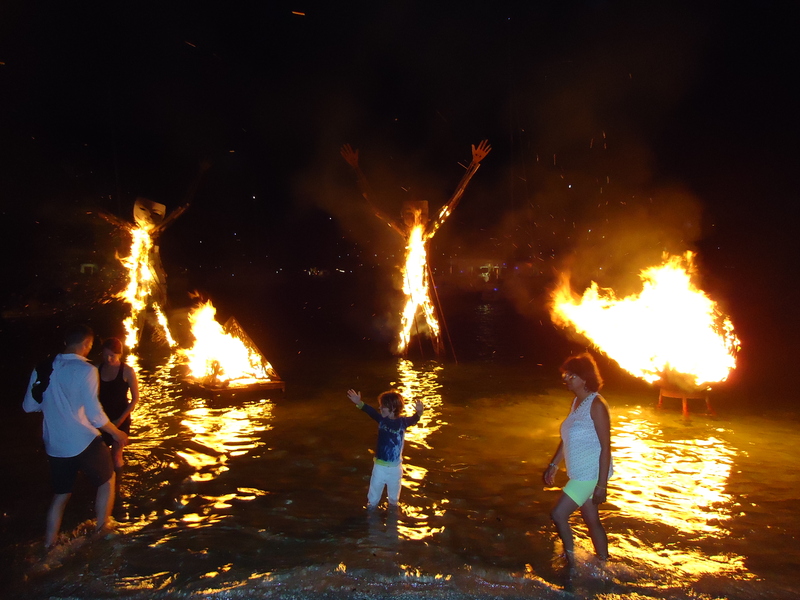 All of this done we set off to Trellis Bay to join in on one of their Full Moon Parties, which take place every last Saturday of every month or the closest weekend to the full moon. 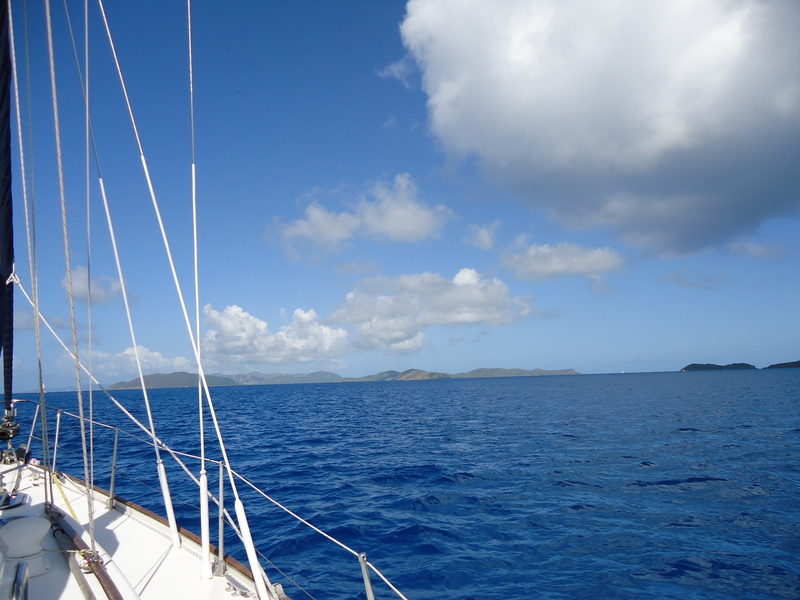 We had a great sail from Spanish Town to Trellis Bay making sure we took photos of each other as we went. 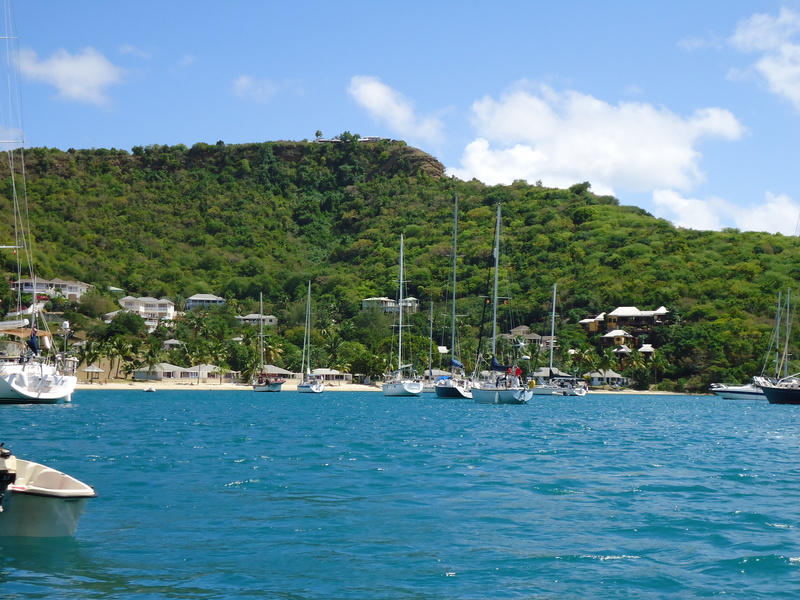 The thing about Trellis Bay, especially near party time is that the anchorage gets very busy but we found space and were settled. We headed to the party around 18:00 and were in for a great surprise. The atmosphere of the party hits you as soon as you arrive. 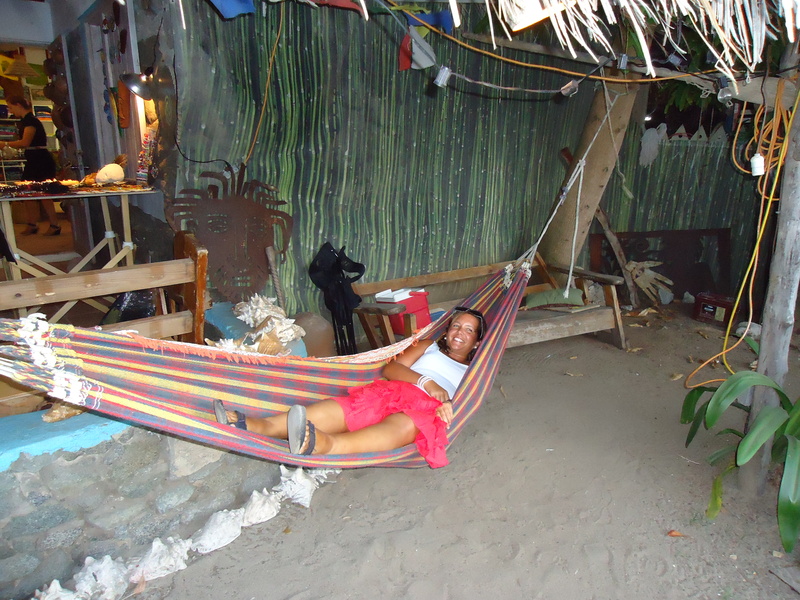 There are plenty of craft stores, bars and restaurants on the side of a white sandy beach. Later on the music got going and the atmosphere increased. 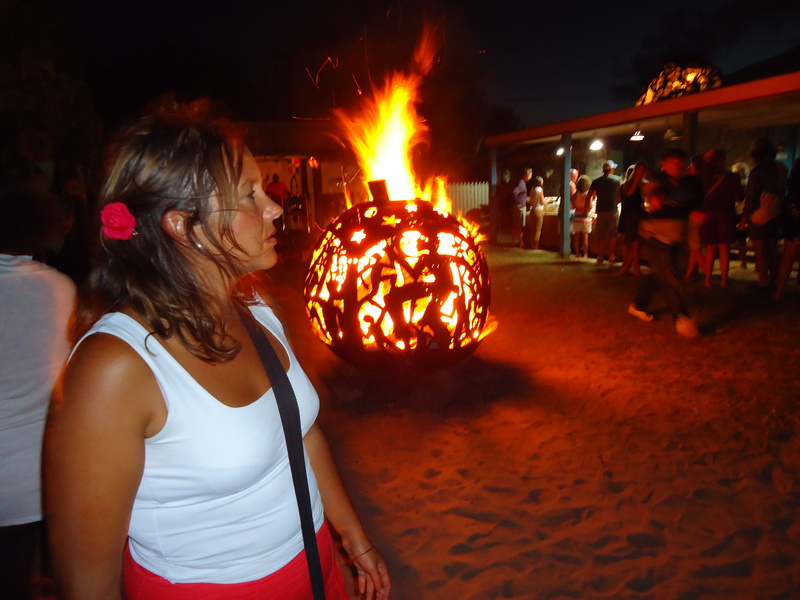 They have metal sculptures dotted around and filled with wood, which the light after 21:00. It seemed like a bit of a hippy set up with plenty of odd people dabbling in crafts of all kinds, but it was pleasant and we had an amazing evening with friends, beers and great entertainment. The night unfortunately went sour. 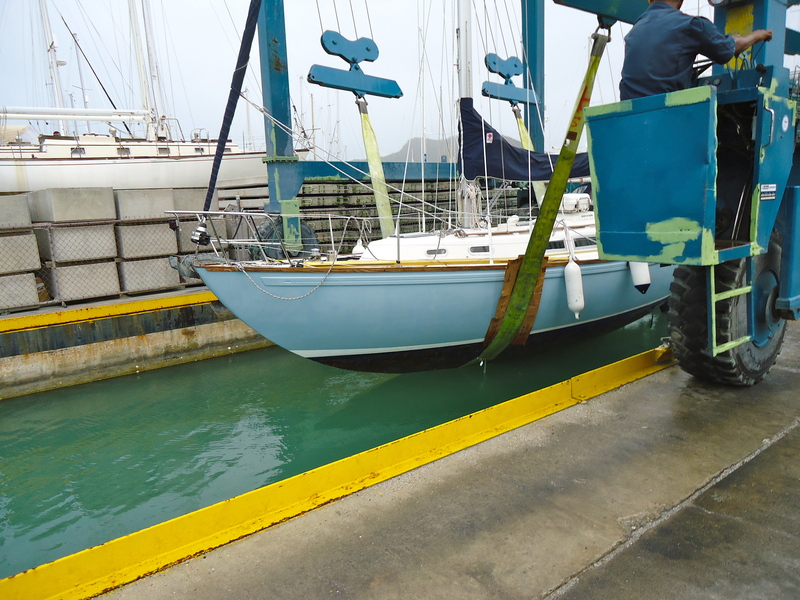 When we reached Troskala we found a Catamaran was trying to make love to her and had damaged her Pull-pit and navigation light not to mention a lot of damage to our rubbing strake. The damage caused to the catamaran looked far greater and we dreaded speaking to the owners the next morning. We finally re-anchored and had a sleepless night. The next morning I went to investigate the damage and speak to the owner. 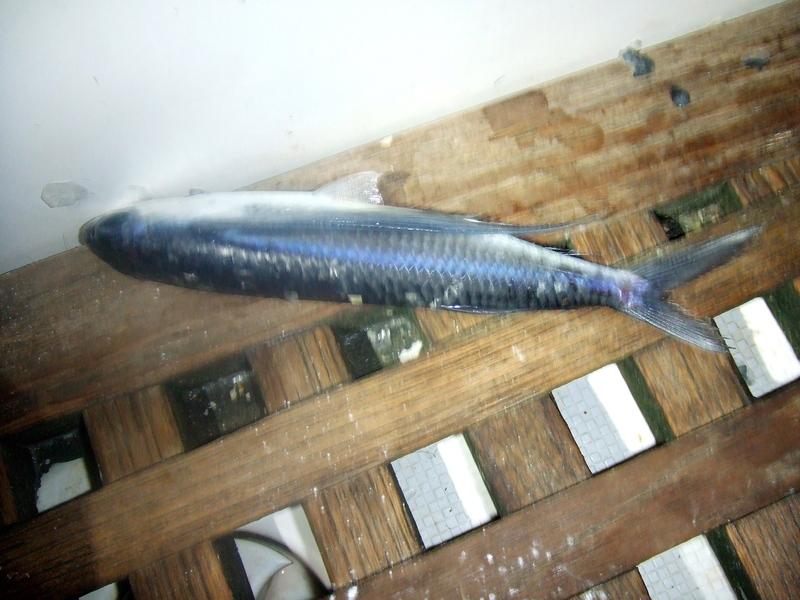 He had sustain a lot of damage to his port side and bow and I expected the worst with insurance companies and the like. We had come in last the previous night but were located far away from the Cat, the only thing we can assume is that he had way too much chain out and as the wind died he came to greet us. Anyway, we were in luck and met a lovely Greek gentleman whoi was very understanding to the situation and did not want to exchange details. We felt much better and decided to continue our journey. 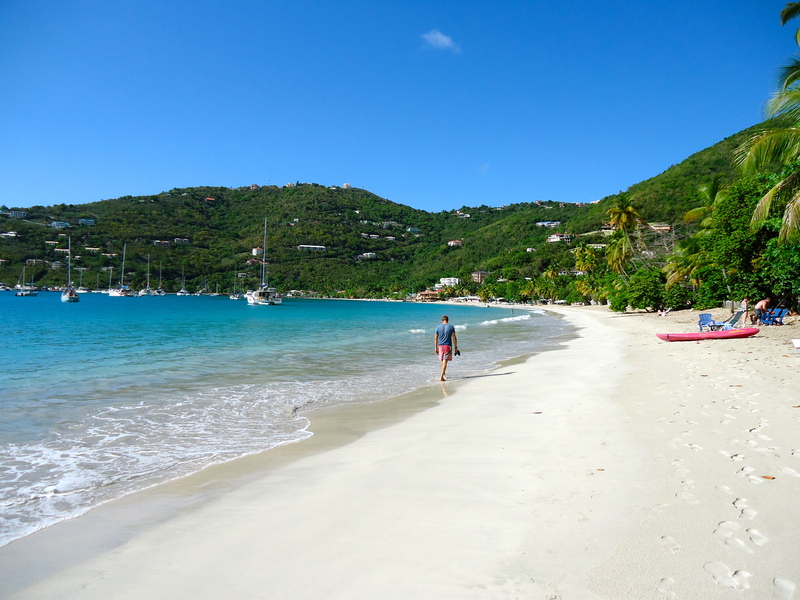 We were heading to Cane Garden Bay http://www.bvitourism.com/wtd/cane-garden-bay-beach on the North side of Tortola. As the winds were light we had to motor but the scenery made up for the noise of the motor and soon enough we found ourselves anchored in a glorious bay. We went for a swim after the rain had ceased and walked up to a view point to get a better perspective of our surroundings. 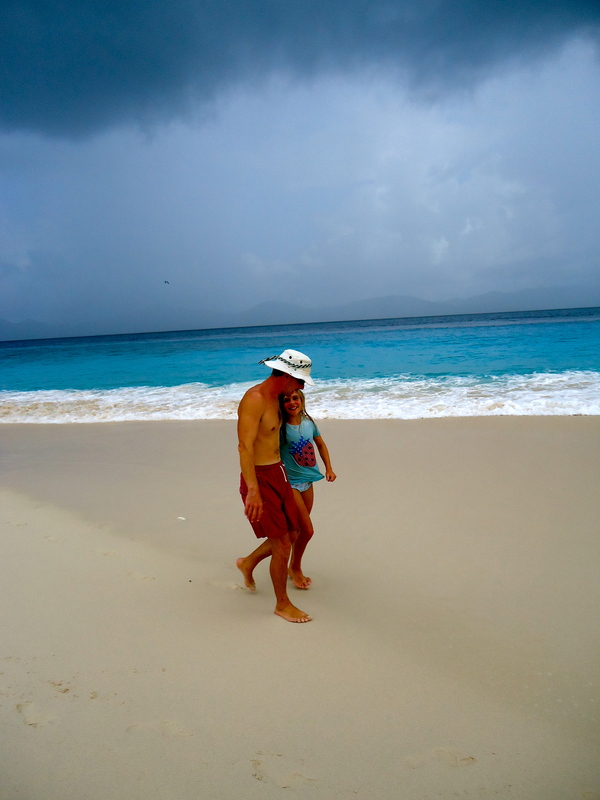 So far we love the BVI’s. 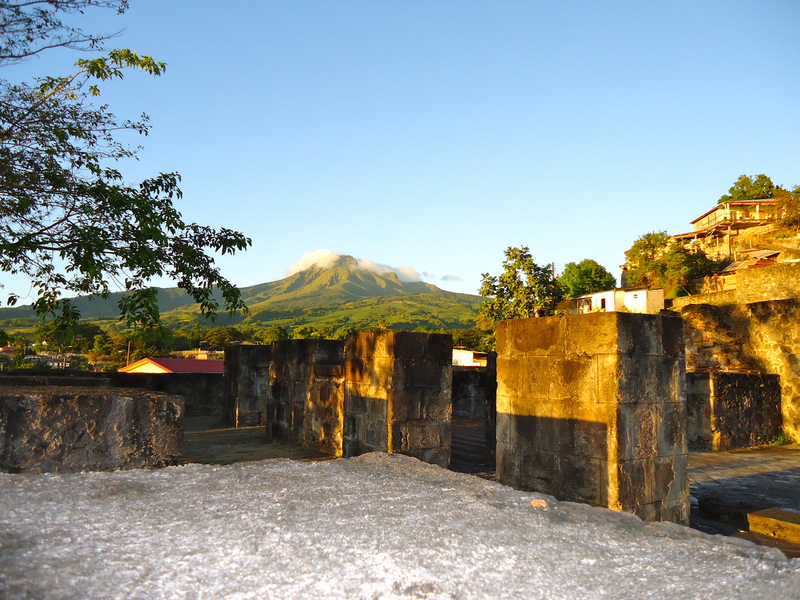 It has a Caribbean feel but the people are more friendly and the scenery is much more diverse than previous islands. 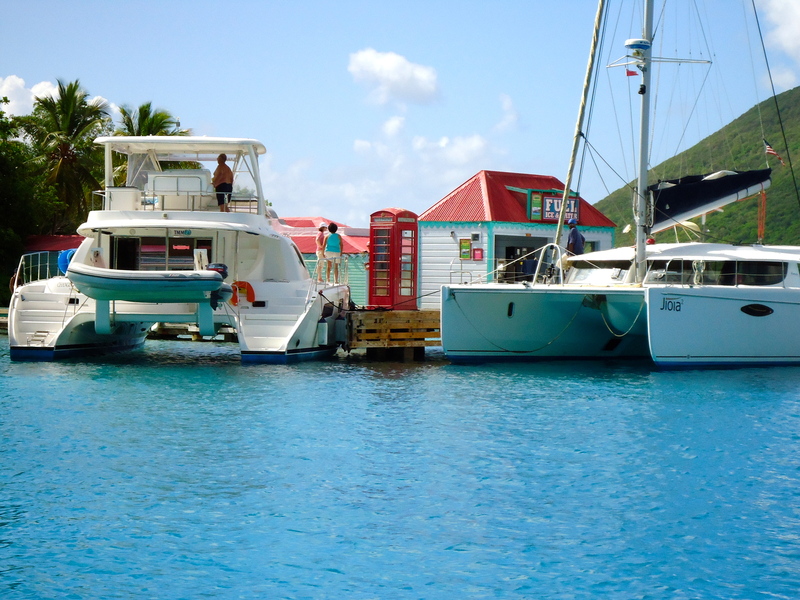 The BVI’s have also to succumbed to mass tourism so places feel like they would have been twenty to thirty years ago. 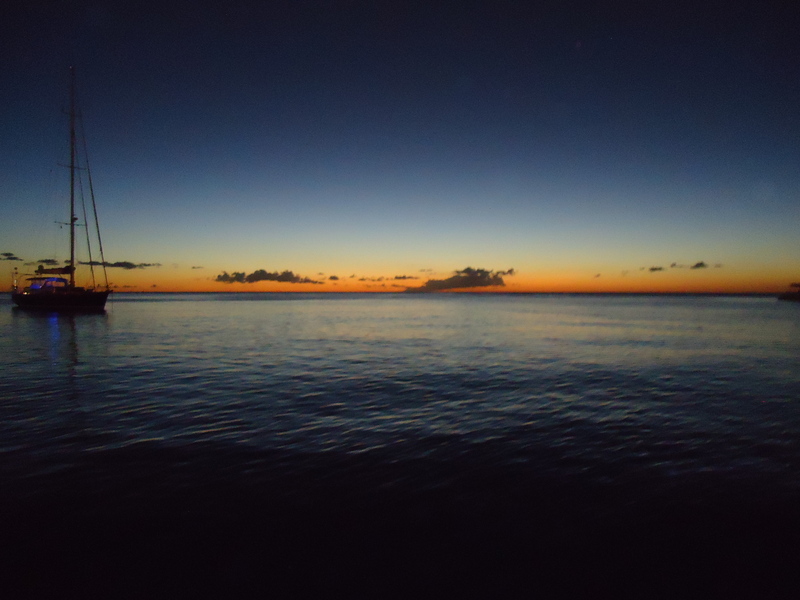 We were joined later by Rafiki and after swimming with Emily and James we had a lovely meal onboard Troskala whilst the moon moved slowly across the sky; it was a perfect end to a perfect day. The next morning brought more sunshine. Carlotta and I went to get some ice and were joined by some other friends on Easy Rider who we had met during the ARC. 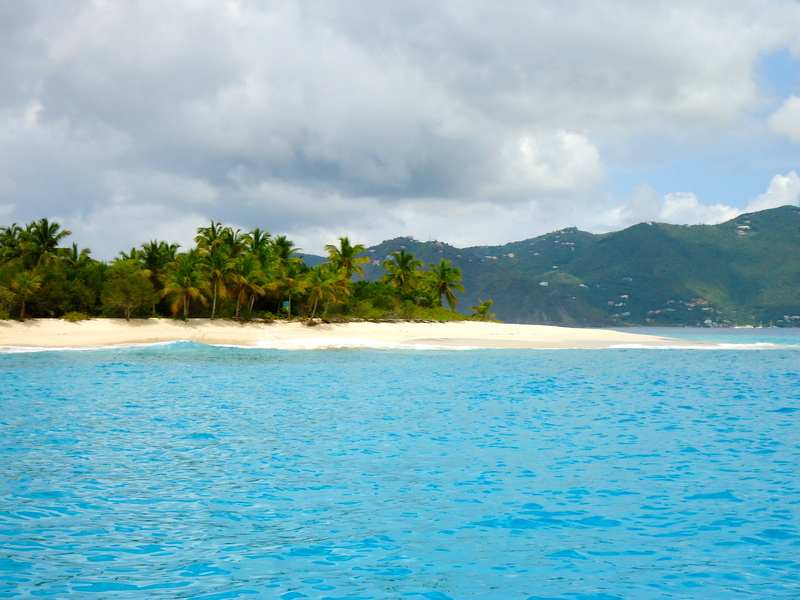 We departed Cane Garden Bay Shortly after and decided to head to Sandy Cay Spit, which is a small island just off Tortola and Little Jost Van Dyke. It was, as you would imagine from the films, a small island with white sand and a few palm trees. 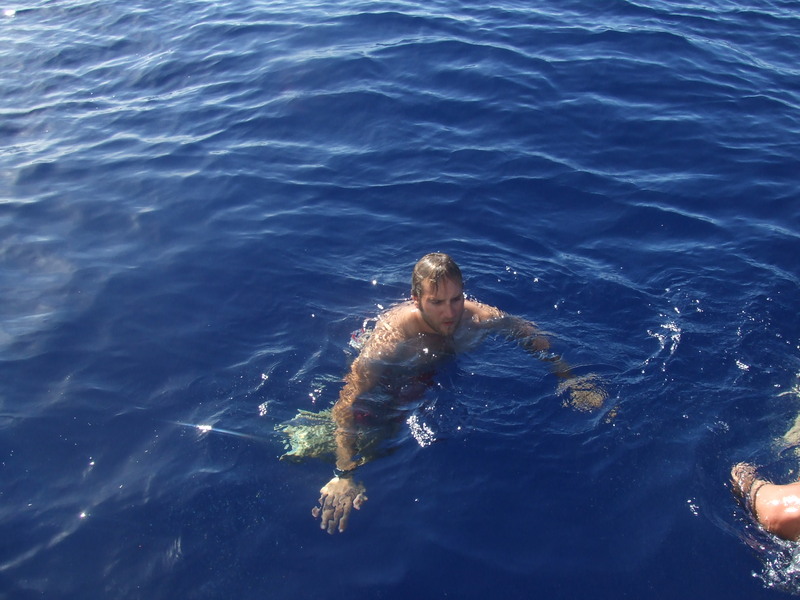 We both picked up a mooring buoy and went for a swim in crystal clear waters. We decided later to investigate the island but after a tricky entrance with a confused swell and then followed by a full-on attack from sand flies we decided to make a quick exit. 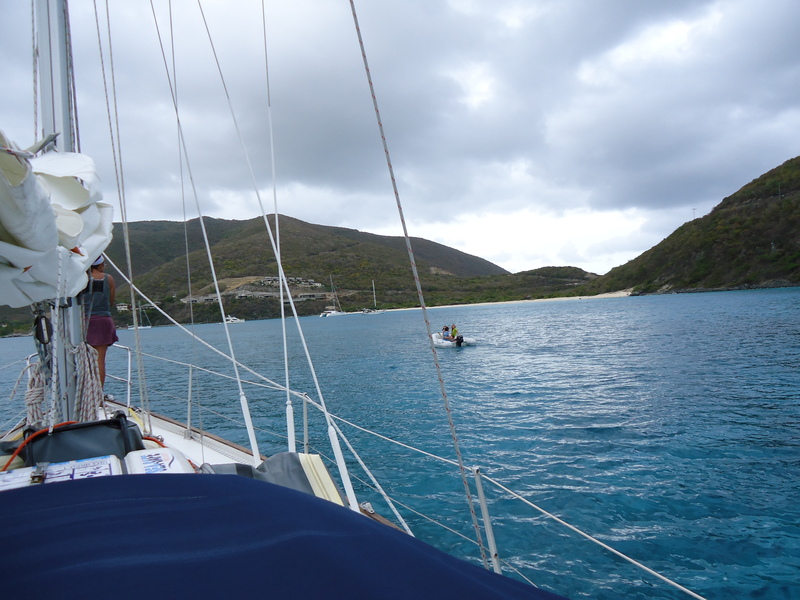 We sailed on to a small anchorage just off Little Jos Van Dyke. 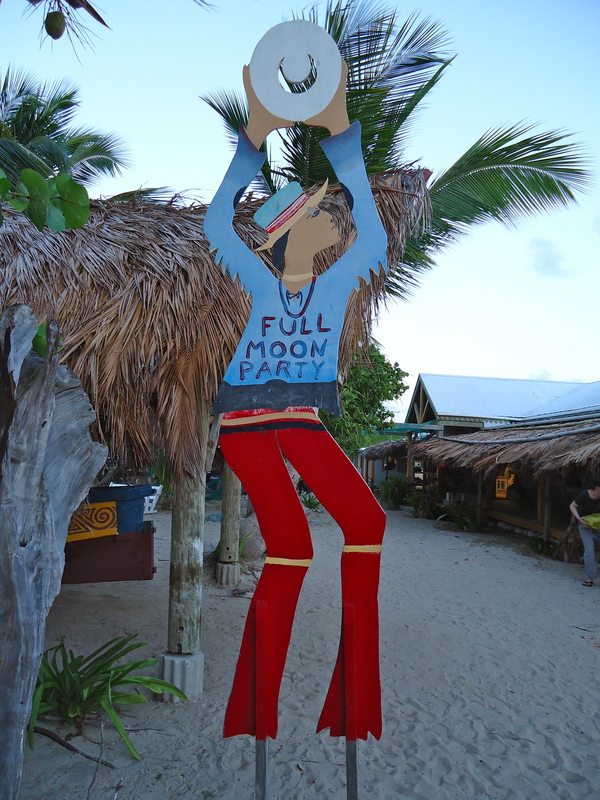 Nearby you could see the angry swell of the Atlantic crashing on coral reefs but we were tucked in close to some rocks and forest; it was a blissful spot and the moon again provided the evening entertainment followed by a lovely meal on Rafiki. 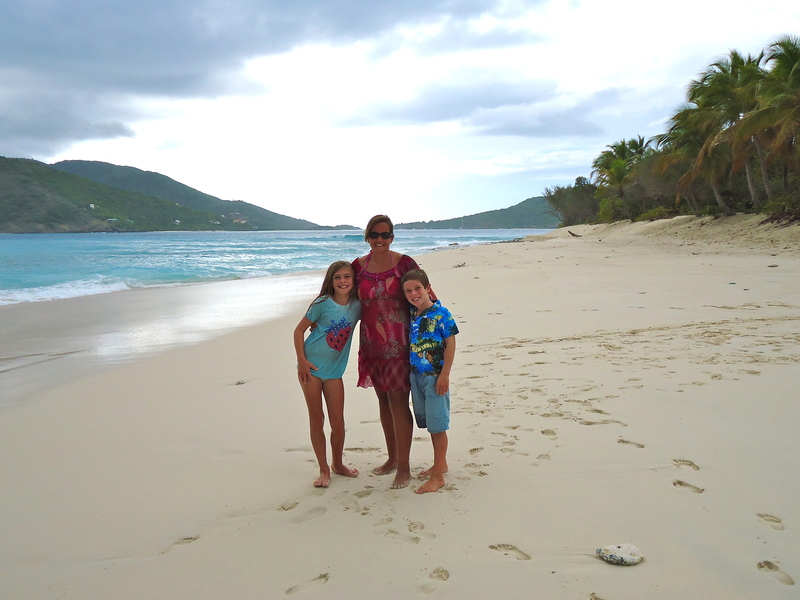 After our lovely visit to Jost Van Dyke we set sail for Sopers Hole on the north east side of Tortola. 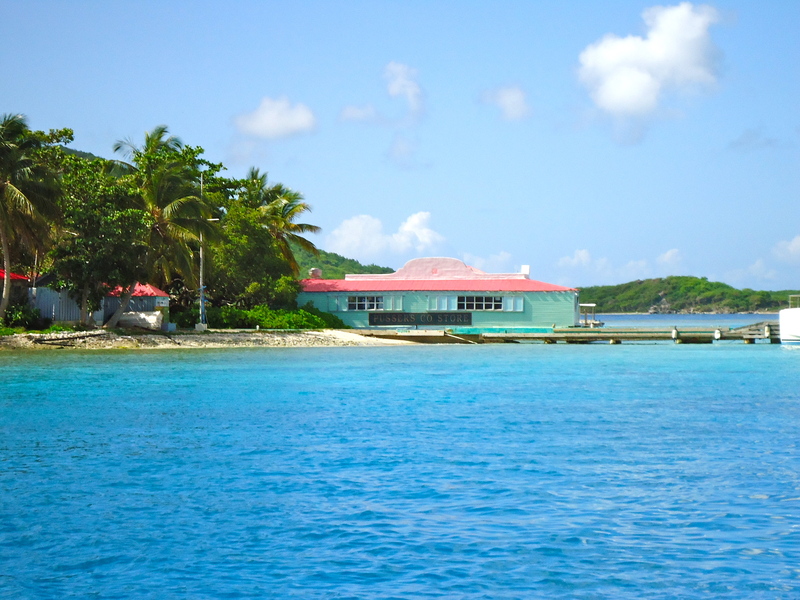 This was a lovely place although anchoring is very limited and the harbour very deep. If you do not want to pay the $30 dollars a night your only option is to anchor in the far corner, which is not so idyllic. We however managed to grab a spot and spent the afternoon looking around the shops and stocking up on some wine at the supermarket. 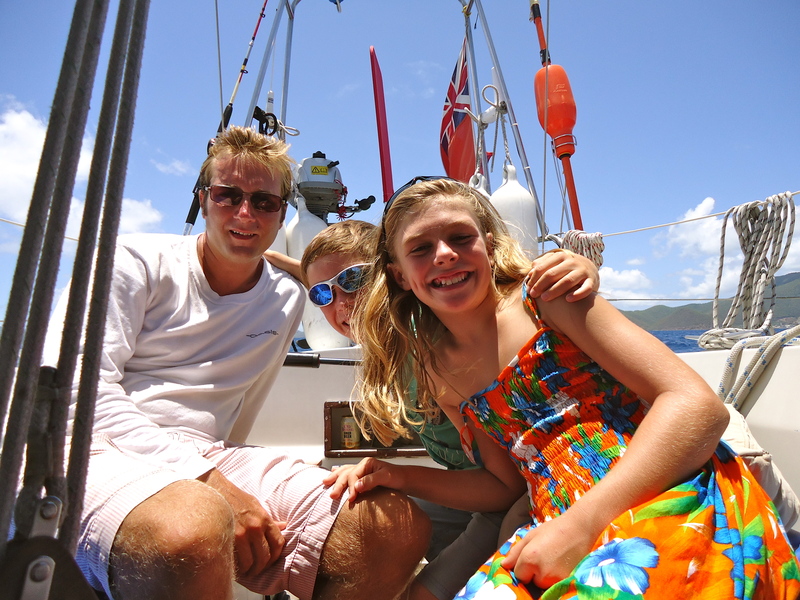 The next day we were in baby-sitting mode and as Rob and Cally had work to finish off before setting sail to the Azores we offered to take Emily and James for a day sail to Peter Island and visit Deadmans Cay. 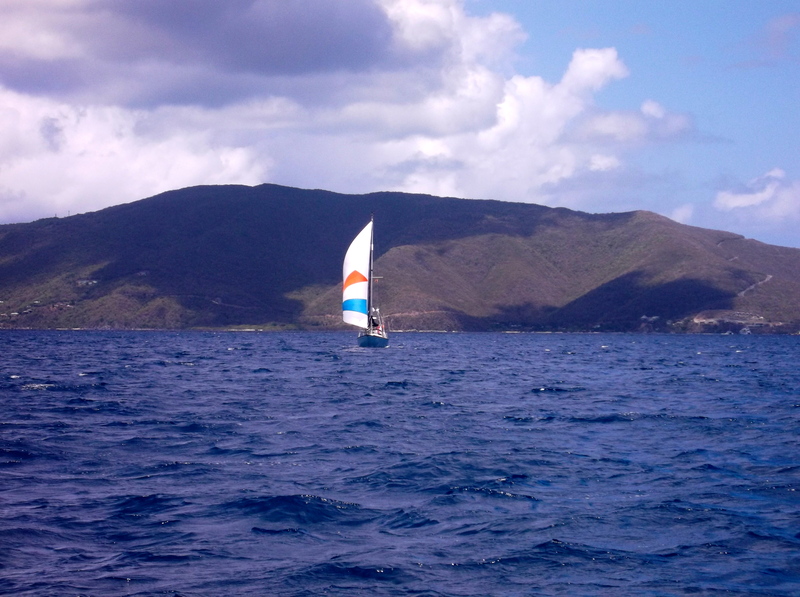 Unfortunately the wind was on the nose and we had to motor all the way there but as we are in the BVI’s the distance is not more than 7 miles. The motoring was worth it and at around midday we entered Deadmans Bay. Again it was idyllic with beautiful sand and green mountains. 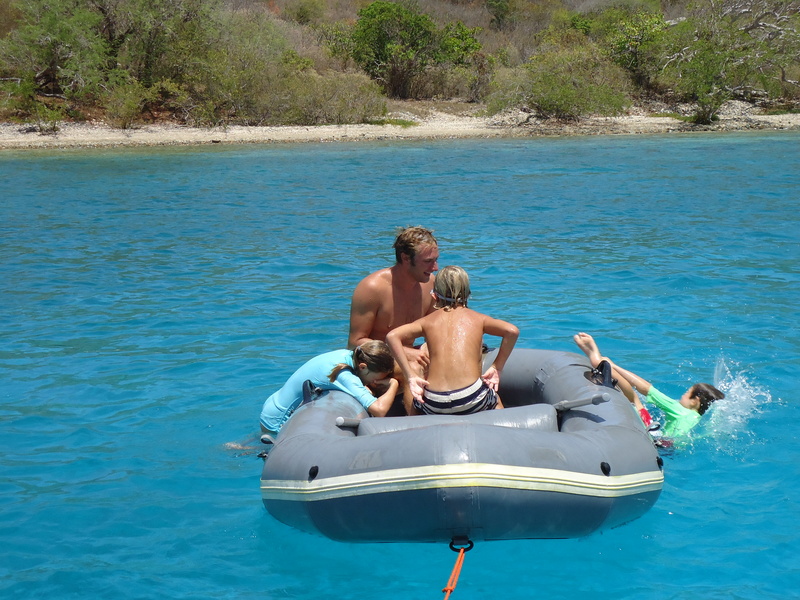 We had a fantastic swim with the children and we enjoyed our time in their company although I was completely worn out after two hours of ‘lets push Oliver out of the dinghy’. 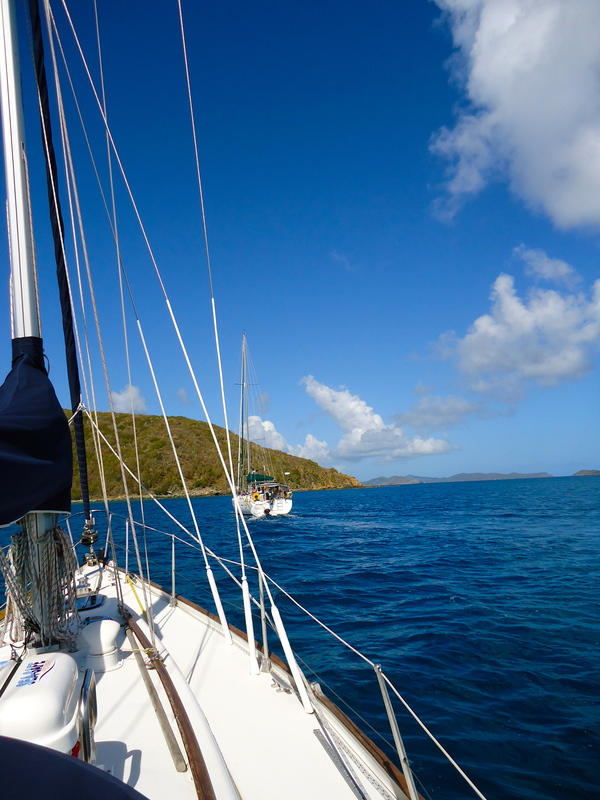 We sailed back to Tortola to drop Emily and James off at Nanny Cay where Rafiki was now located and then we sailed on to Road Harbour where we anchored for the night after a few attempts. 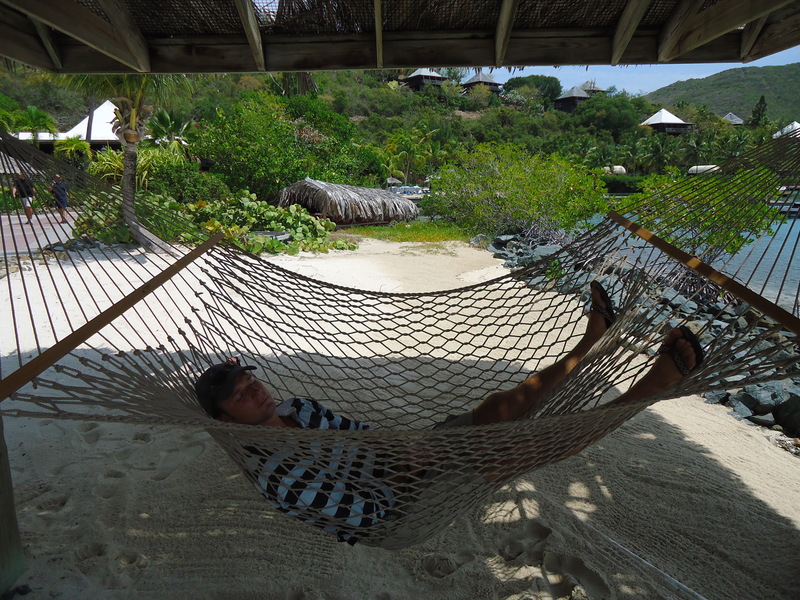 Anyway, the plan is to stay in the BVI’s for the next month before we decide on our next plan of action. We will post more photos shortly and will keep you updated on all the islands visit. We wish you all the very best and we look forward to posting more soon. 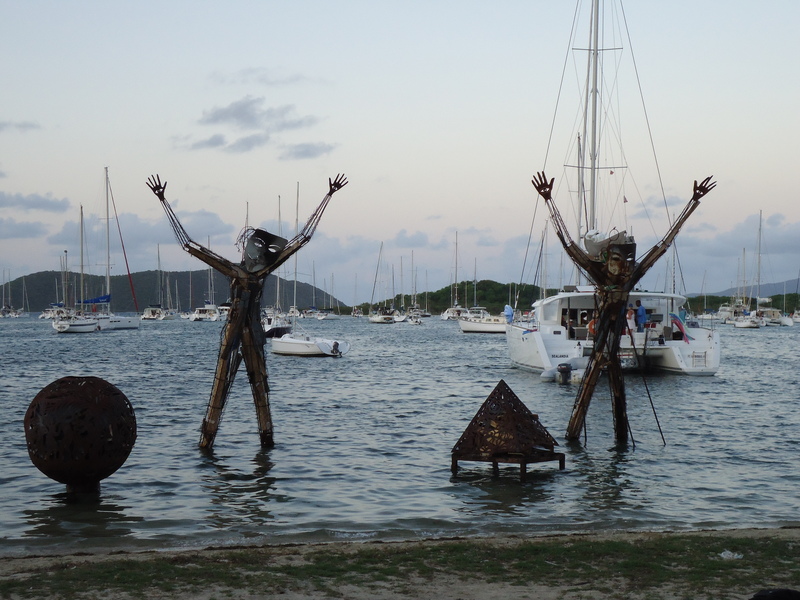 I am currently sitting in Shrimpy’s (www.shrimpys-stmaarten.com) in Marigot Bay (St Maartens). This is a great place for cruisers to meet, use the Internet and buy second hand goods. 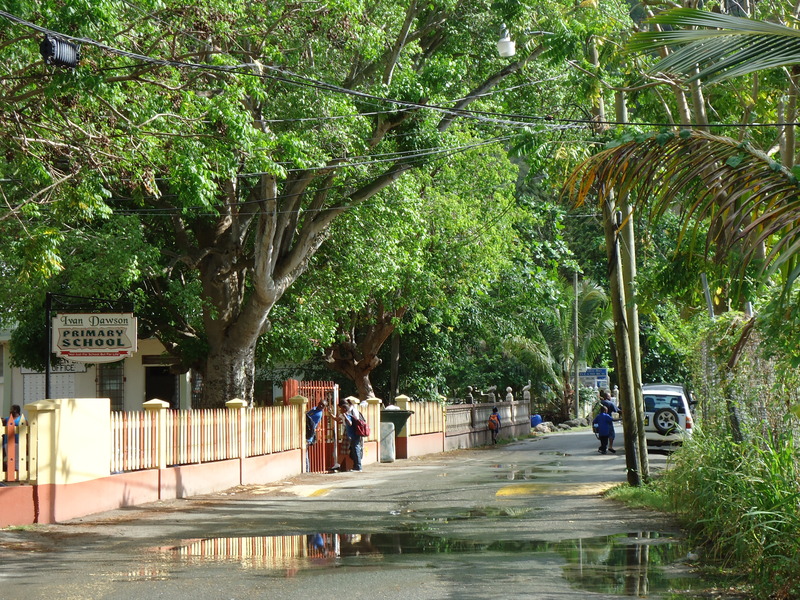 They also offer water and information on where to get things done in and around St Maartens. Mike and Sally who run the place will do laundry and also provide a radio net at 07:30 each morning for all cruisers. Discussion ranges from Safety and Security, new arrivals/departures, general info and weather. We managed to sell our lovely sat phone yesterday for half the price we brought it but at least it is not going to sit in a draw for the next 10 years loosing more of its value. Well, I would love to share more photos and say we have been up to a lot in the past week but this would not be true. Firstly we have been stuck in Marigot Bay for 4 days whilst high winds blew through so due to this we will miss Anguilla this time round and head straight for Virgin Gorda tomorrow, which is in the BVI’s (British Virgin Islands), where we will meet a few friends and spend a month exploring the 54 islands that are there including Richard Branson’s. I better start from the beginning of our trip instead of at the end. We left Jolly two days after being launched. 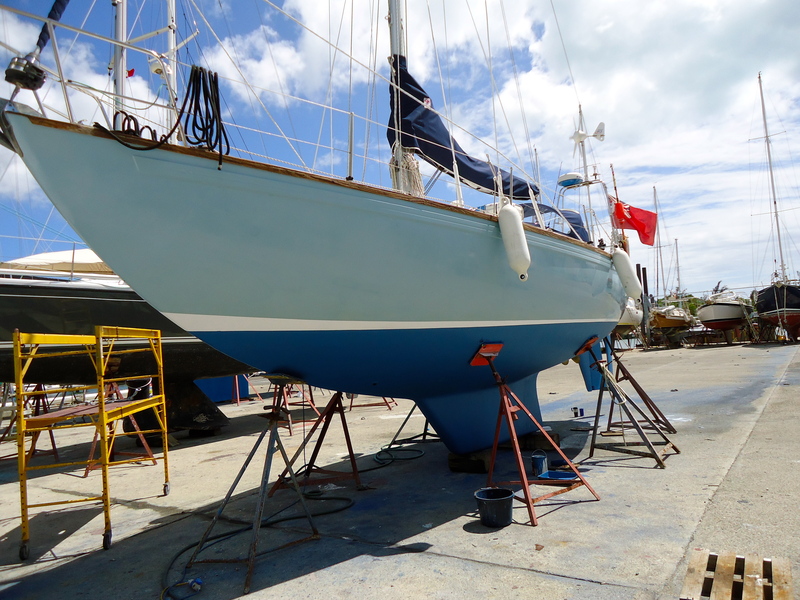 We victualed, fuelled and prepared for a passage from Jolly Harbour to St Bart’s. 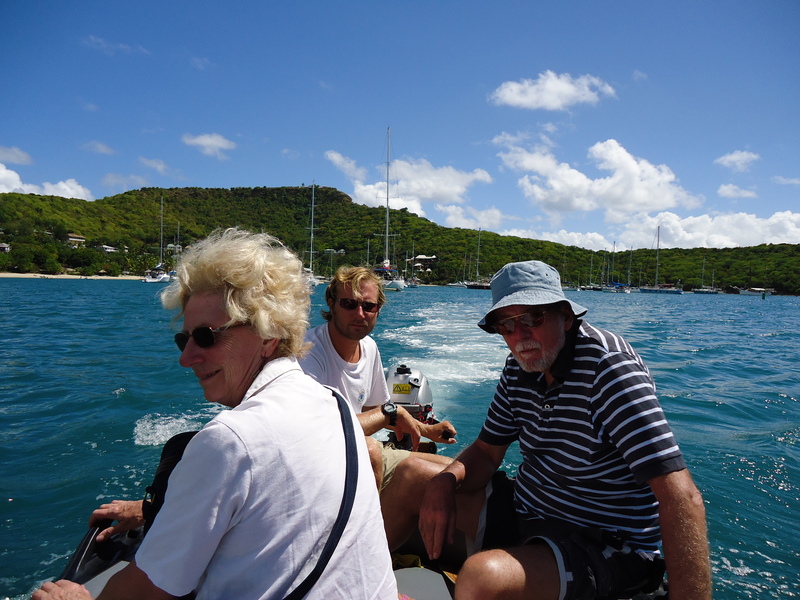 We departed at 04:00 in the morning and had to complete 80 miles to Gustavia. 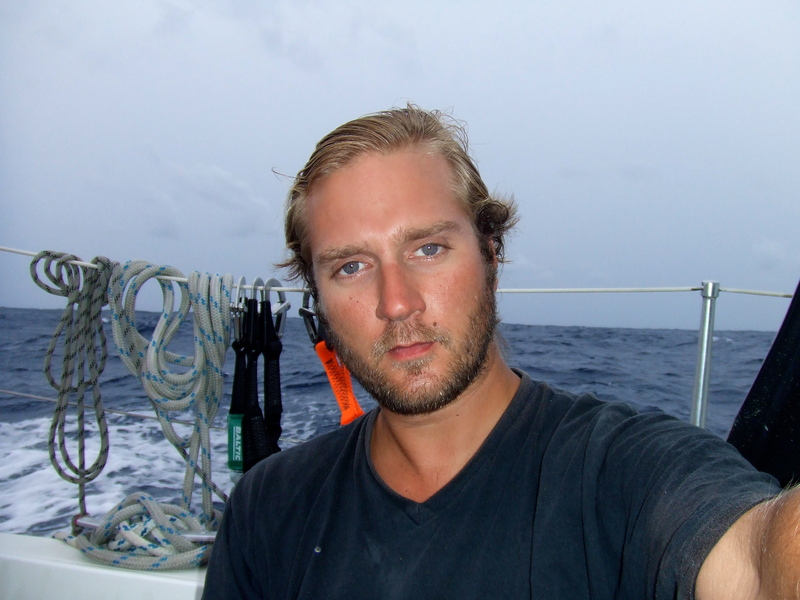 With a clean bottom Troskala flew and averaged 6.6 knots. 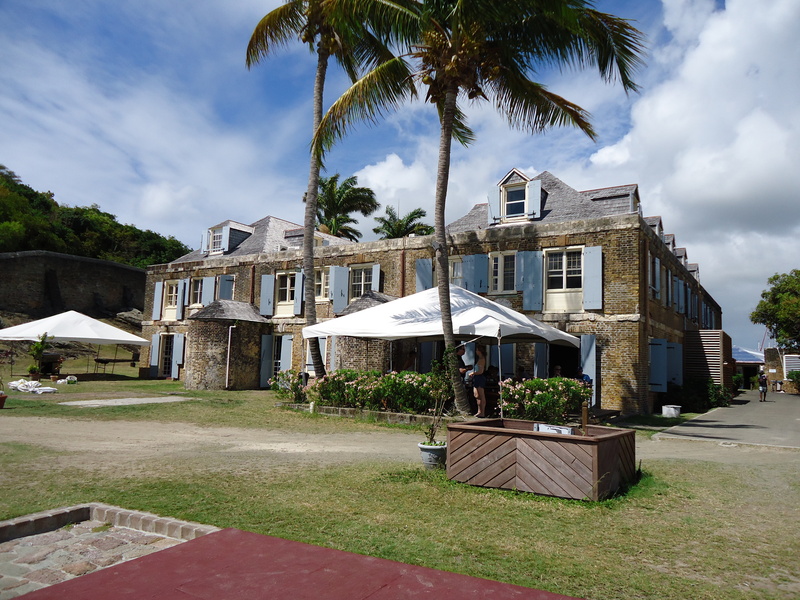 We made Gustavia 12 hours after departing, which is a record for us. We again anchored in the same place as we had before although the anchorage was packed as it was just coming to the end of their Richard Miller Regatta. 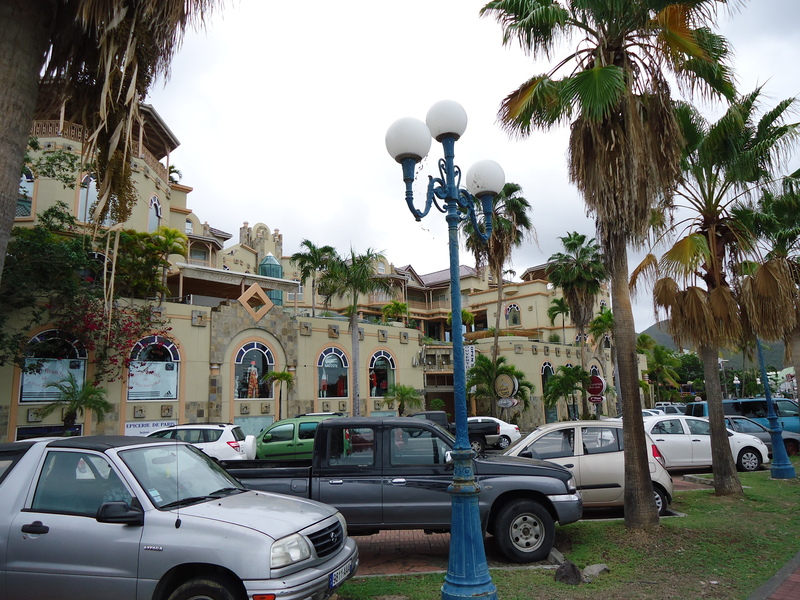 We walked around Gustavia and to Shell Beach the following day. 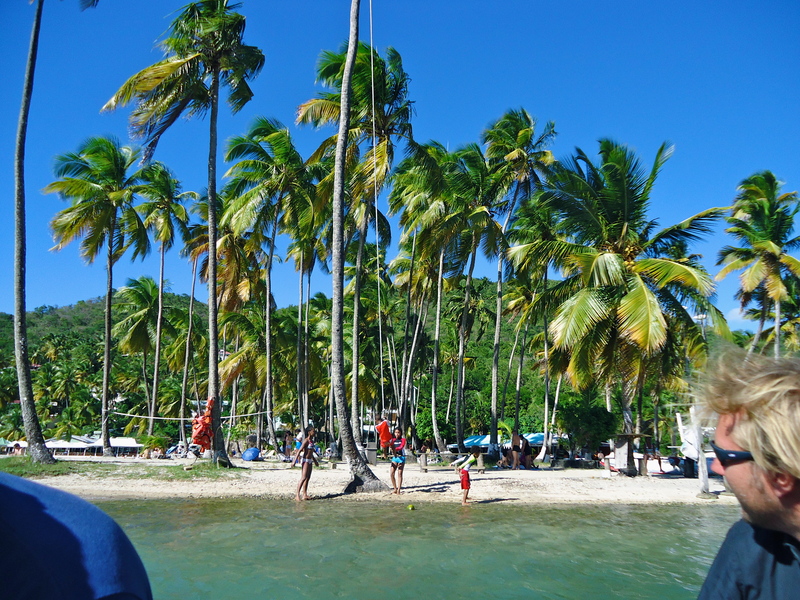 We decided not to check-in this time and instead move on the Anse De Columbia for the night and then depart and head to St Maartens to explore this island further. 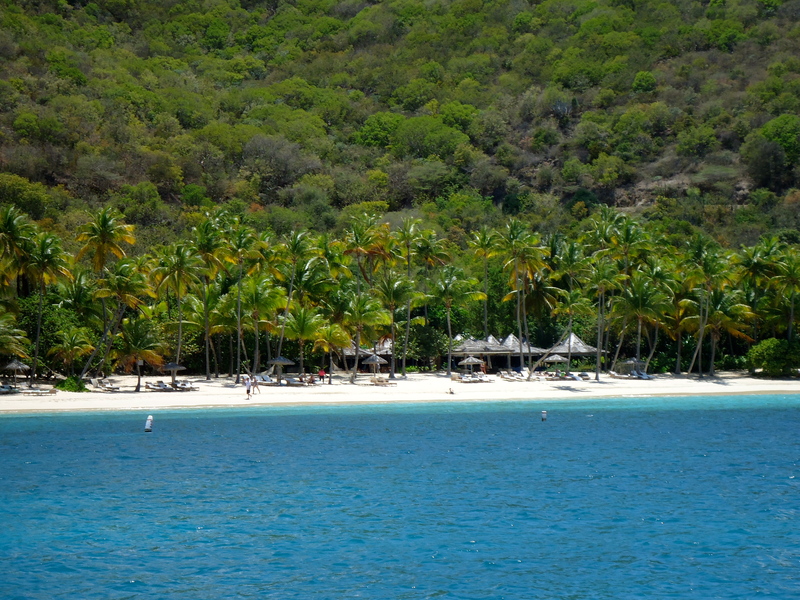 We left Gustavia in the afternoon and all went well for the 2.7 miles until we reached the beach. 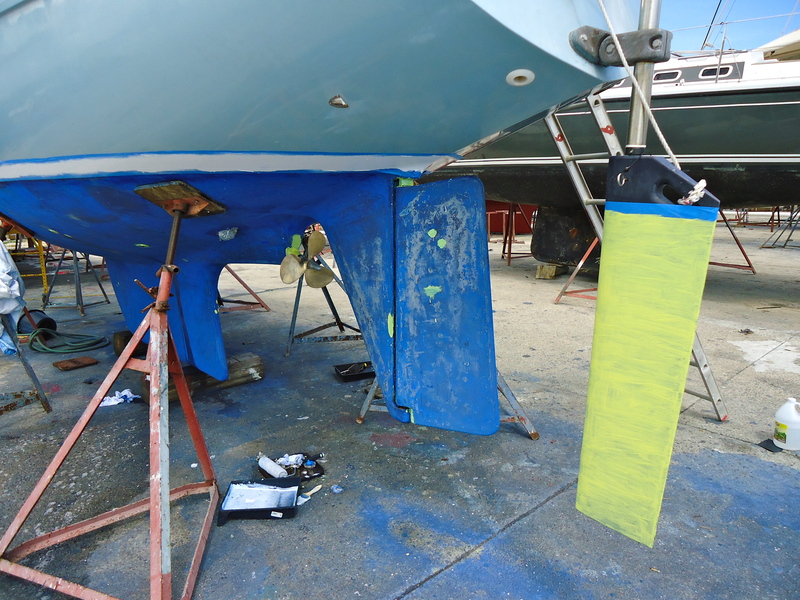 I had recently fitted a longer painter to the dinghy, which was made out of an old halyard – big mistake. Carlotta was on the helm and as I dropped the anchor she engaged reverse. 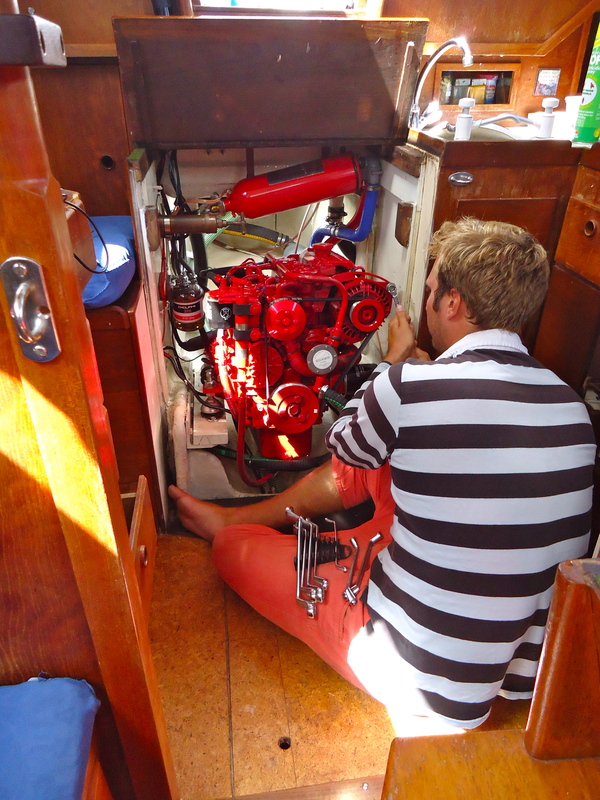 Thank God the anchor held as a split second later the engine cut out – a first for our engine. I did the stupid thing of re-starting it without finding the cause of the issue before but I guess that under stress we all do things we wish we could have not done. 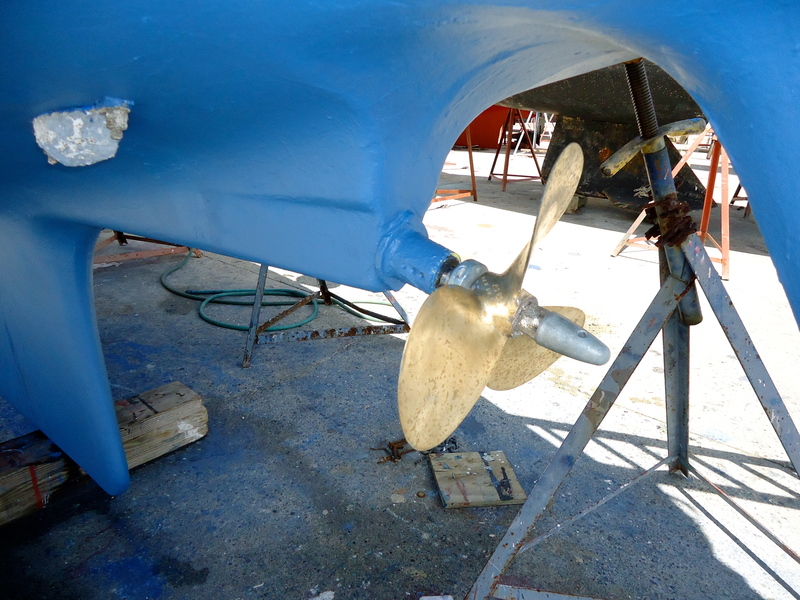 Luckily for us the engine again cut out and I quickly established that the painter was caught around our prop. 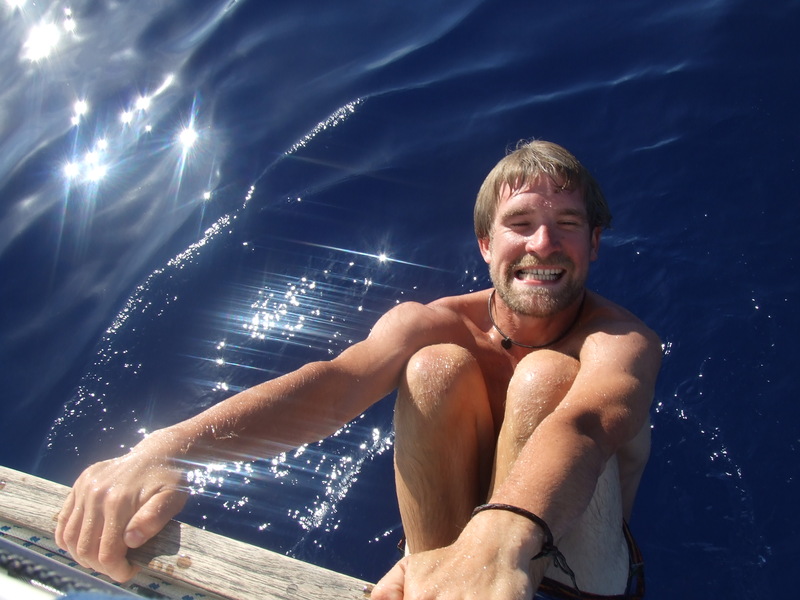 For us we could not be in a better place, the water was clear and I was able to snorkel down to free the rope with the knife. No damage caused but a good lesson. 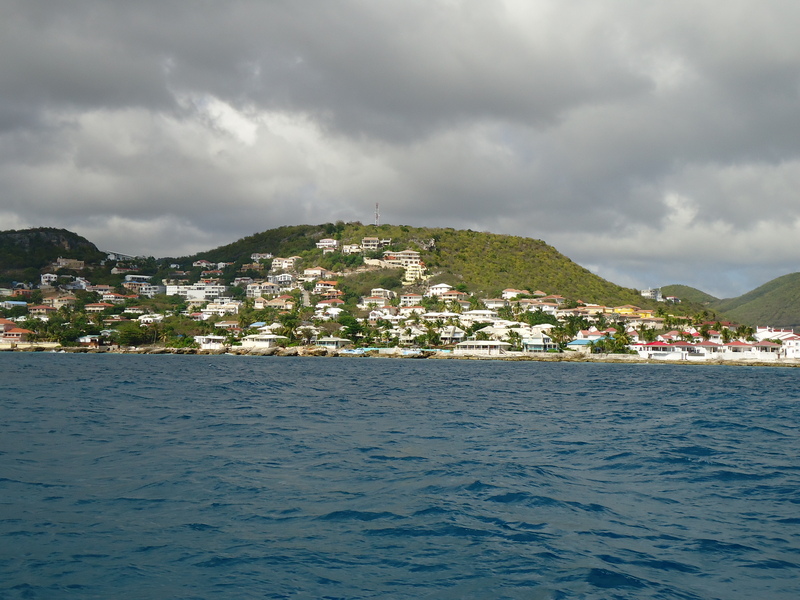 We spent one afternoon in Anse De Columbia before sailing the 12 miles to Philipsburg to pick up some duty-free alcohol and then onto Simpson Bay. We still cannot understand the excitement people have with St Maartens. The Dutch side is very developed and because that damaged. 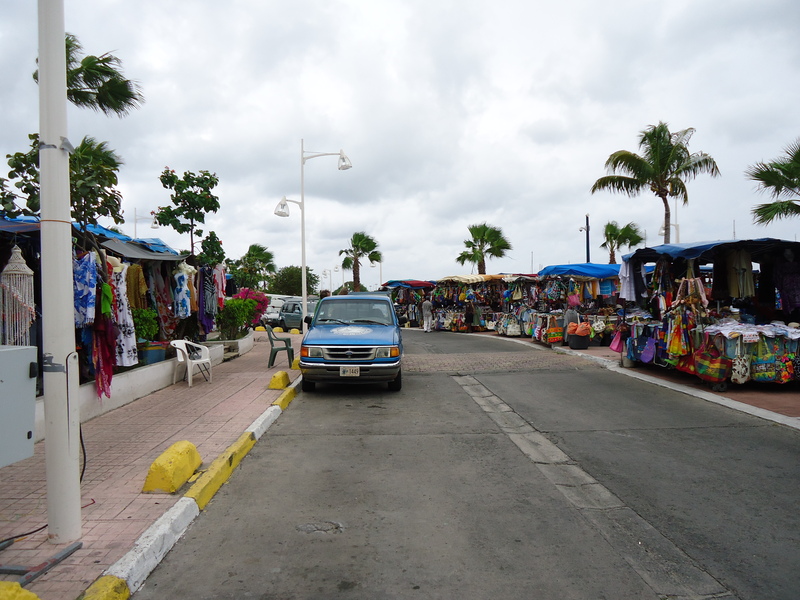 In Simpson Bay there is not a lot on offer except a long busy road with various restaurants and a Mac Donald’s. We spent our first day exploring with the dinghy the Lagoon but even this was not great and mainly consisted of chandleries and restaurants. The beaches are nice but the water is not clear. 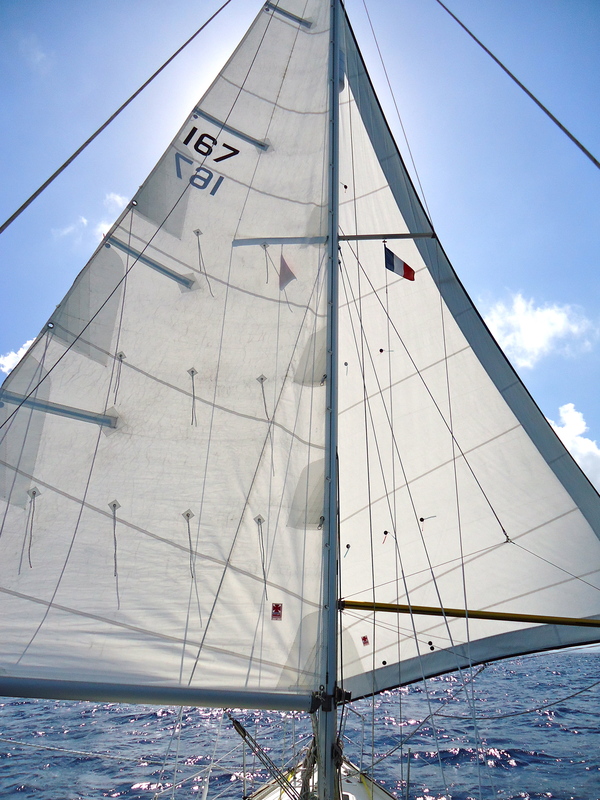 We did not spent too long in Simpson Bay and instead decided to sail around the coast to the French side and anchor in Marigot Bay. 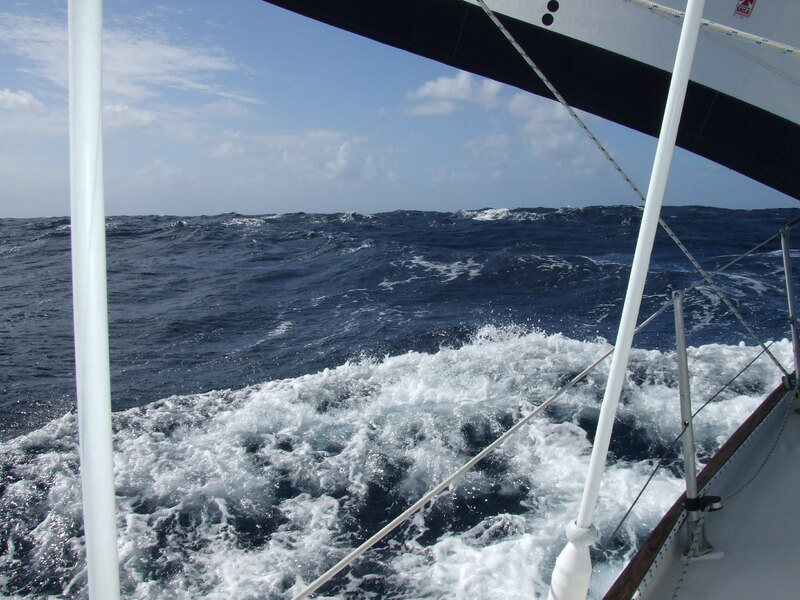 We knew the wind would pick up and as soon as we rounded the corner we were hit with 35 knots of wind and one hour bashing under motor to get to Marigot Bay and the security of the anchorage. 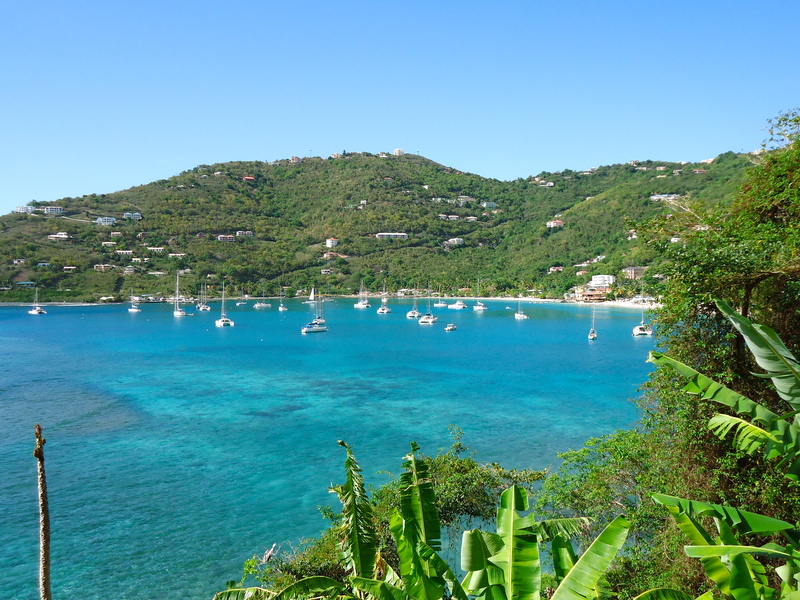 Marigot Bay, along with the other bays: Grand Case and Anse Marcel are great spots. The French have managed to keep these places cultural instead of ruining them with hotels and cheap bars. Marigot itself is a lovely town with some good shopping but a local feel not forgetting Fort Louis, which is an old fort looking down onto the town and the bay. The people are friendly and the Supermarkets are cheap. Marigot has a great Shopping Centre and the highlight of one of my days was to ride an elevator for the first time in 10 months – we need to move on. 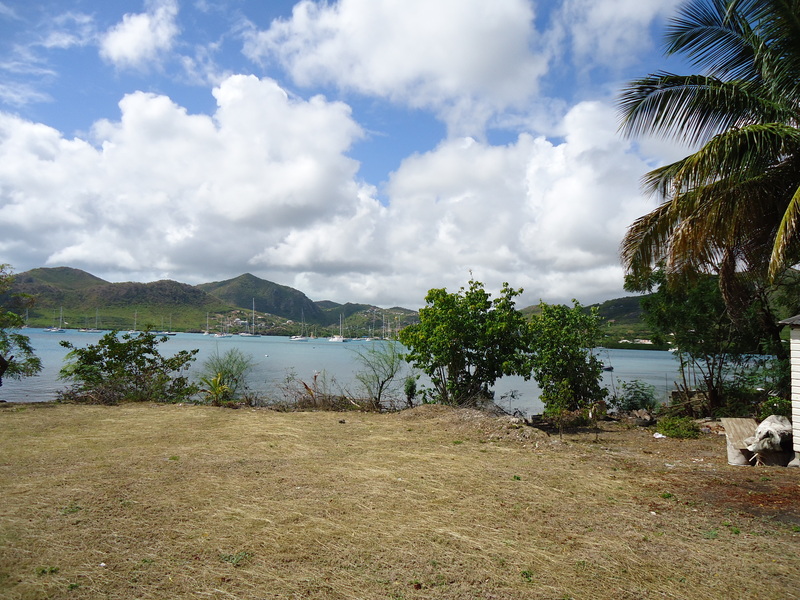 The wind increased whilst we were in Marigot but it was not a bad place to get stuck as it is fairly sheltered and there is a lot to occupy yourself in town should you wish to explore. 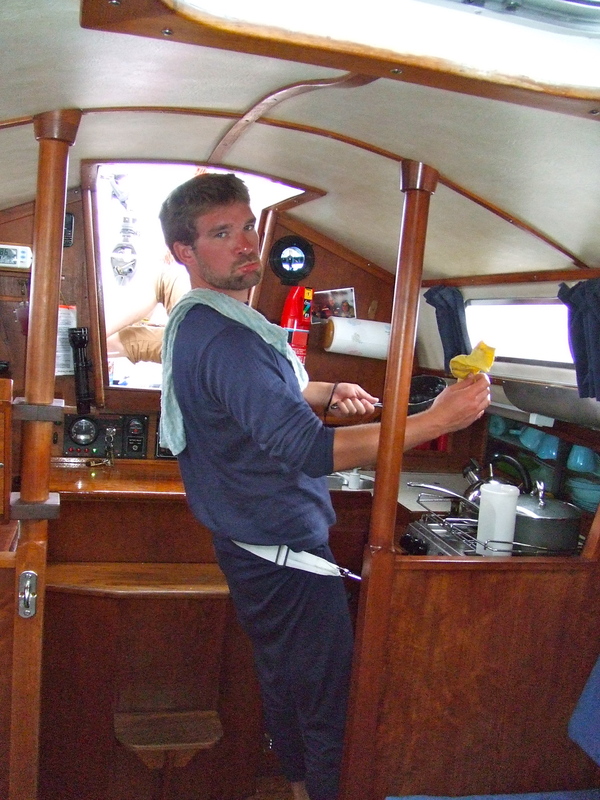 The days lying at anchor gave me the opportunity to work on the engine and luckily I did. I have been having some problems getting charge through to our batteries from the alternator and I put this down to the belt slipping. I adjusted this and fixed the issue but to my horror, when adjusting the alternator I could actually move the engine. This was not good news and further inspection showed that all but one of our engine mountings were loose with two bolts missing. The engine is only a year old and I should have checked the mounts earlier but thank goodness it was checked now and all bolts are now tight and the engine is secure. 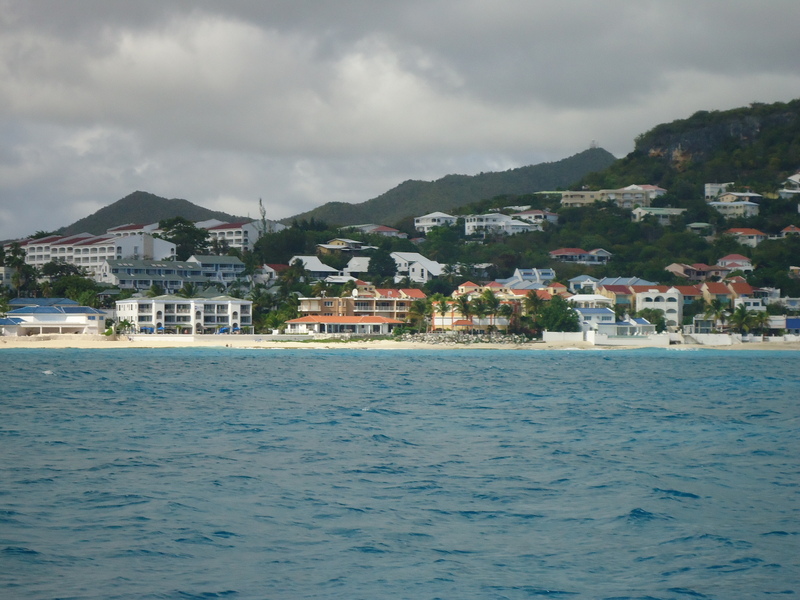 To some up St Maarten’s I would have to say that there are nicer islands in the Caribbean. 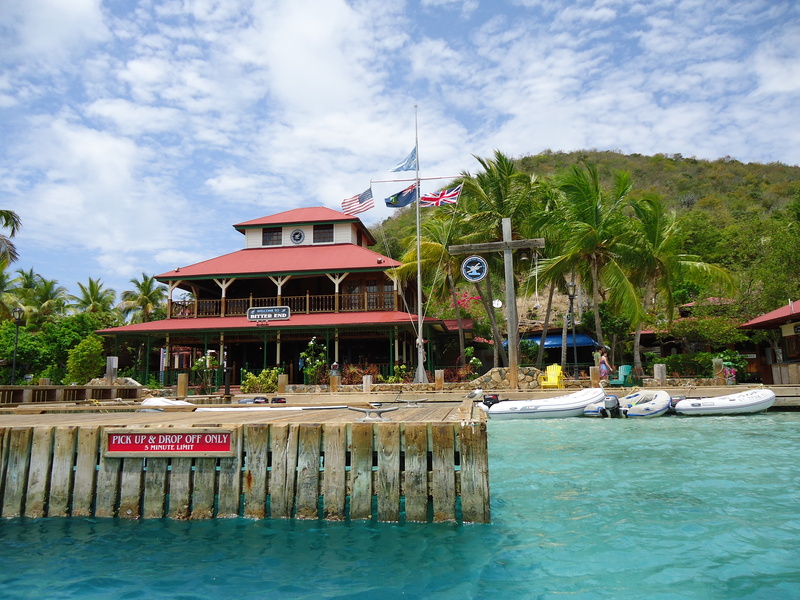 If you have work to carry out on your yacht, then this is the place to do it. You can miss the Dutch side unless you like noise, cheap bars and need and Mac Donalds. If you like you can take a trip to Maho Bay and sit on a beach close to the runway and watch air craft land only a few meters above your head. We decided we did not want to be sand blasted and past on that option although in the guidebooks this is the only ‘must-see’ place, so that just sums up the Dutch half. If you want quality, head to the North or North East coast. There are some great parties and great towns not top forget, culture, walks and great scenery. Grand Case is the gastronomic capital of the island and you will not be disappointed. Anyway, we need to press on and we will be heading to the British Virgin Islands tomorrow morning at 01:00AM. We have a lot to investigate and hope to spend a month there. 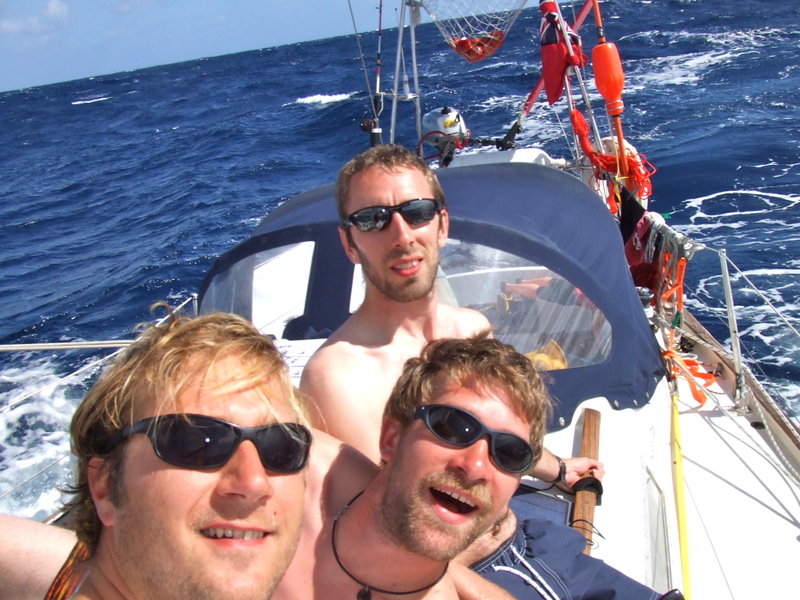 We look forward to new islands and meeting up with some old friends, so watch this space. 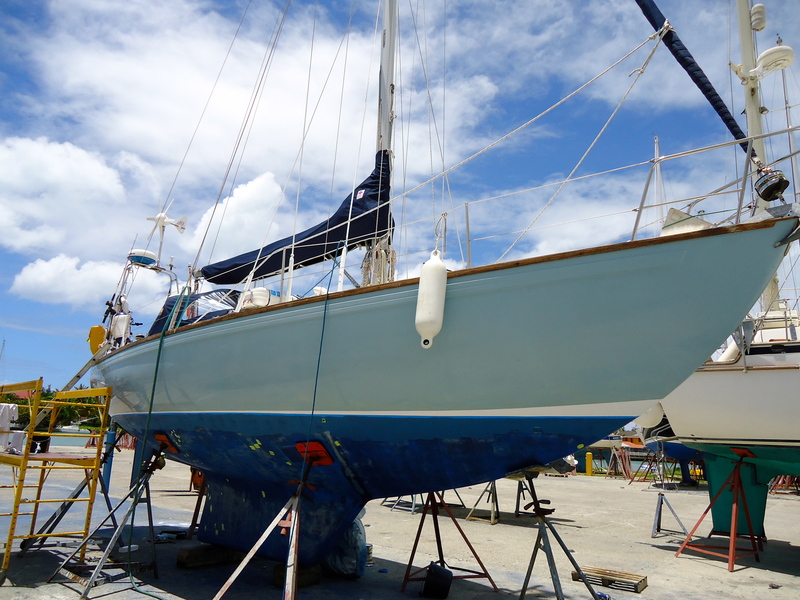 After we had fixed Oscar (Outboard) we were ready to hop over to St Kitts, which is only a 3 miles sail. We were heading to Reggae beach, which sounded like the place to be, plus they had a bar, ice and a shower. We completed our small voyage under motor and within an hour after navigating the narrows we found ourselves in a very secluded and beautiful little anchorage. The wind was still blowing but we were able to position ourselves nicely behind a mountain and only a few yards from the beach, which was already filling up with tourists. 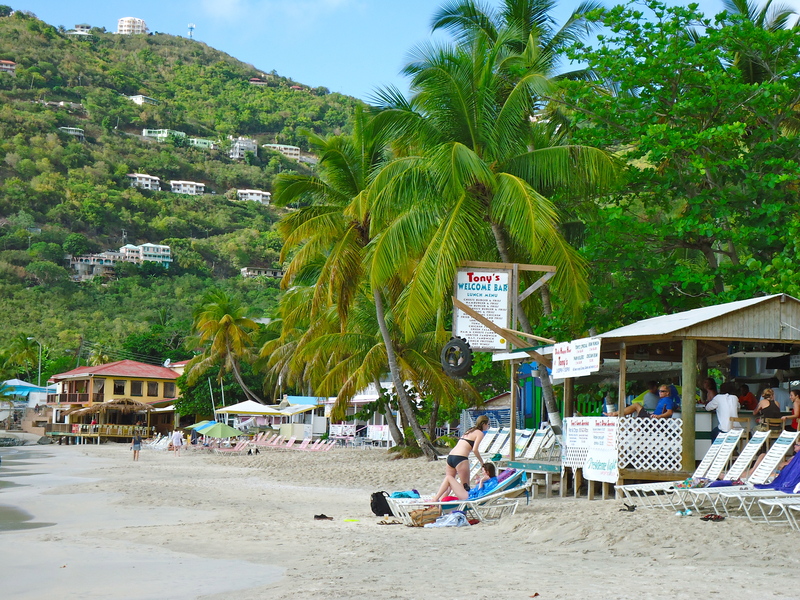 Reggae Beach is a great spot. 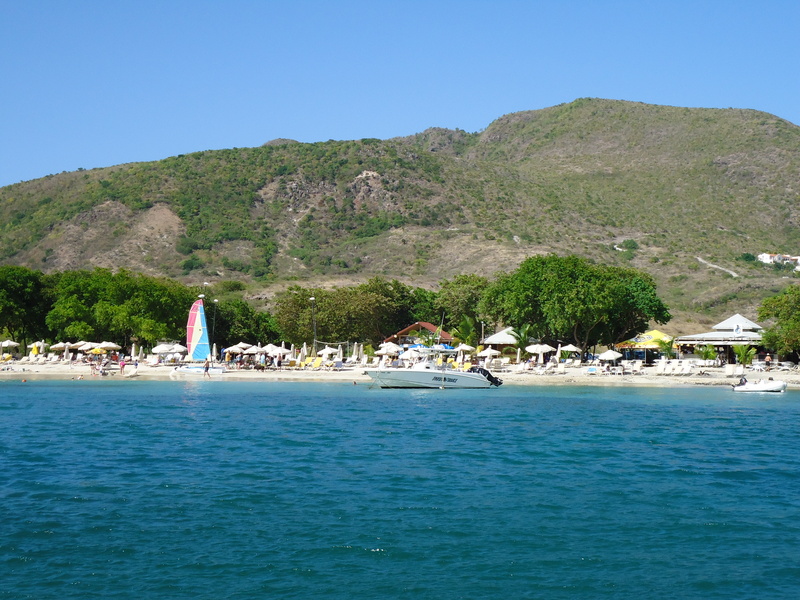 The popularity of Reggae Beach comes mainly from cruise ship tourists that excrete their tourists from the city of Baseterre, only a few miles north. Even though it is mentioned in the guide book as a busy place we found it quiet. There is a lovely bar and beach. We were the only yacht at anchor for the two nights we spent there, which is a first and a unique experience. We spent two days at Reggae, swimming and relaxing, I think that Nita and my Dad are finally seeing what we see in this life style, no rushing, no stress and sun every day. 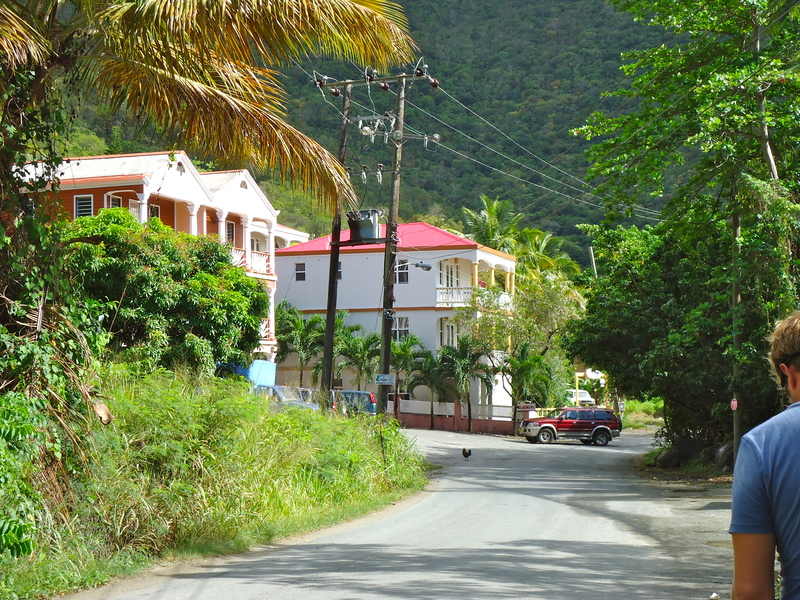 What is different about St Kitts is the landscape. Yes, it has a mountain but it is a lot more arid than previous islands we have visited. You could say that St Kitts looks more like the Canaries than the Caribbean due to its lake of rain. There are plenty of beaches around the South coast but most are stony instead of sandy. 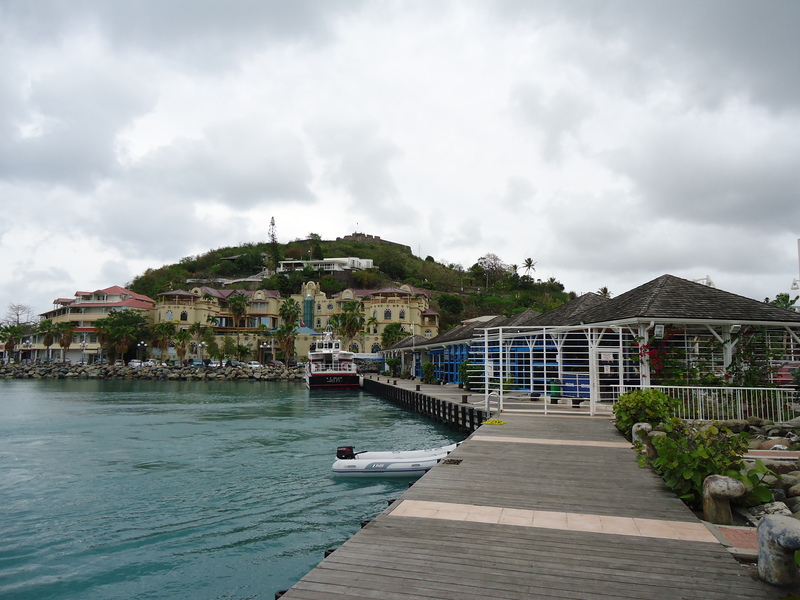 We had made it to Jolly Harbour just in time to meet my Dad and Nita at a lovely bar on the waterfront. 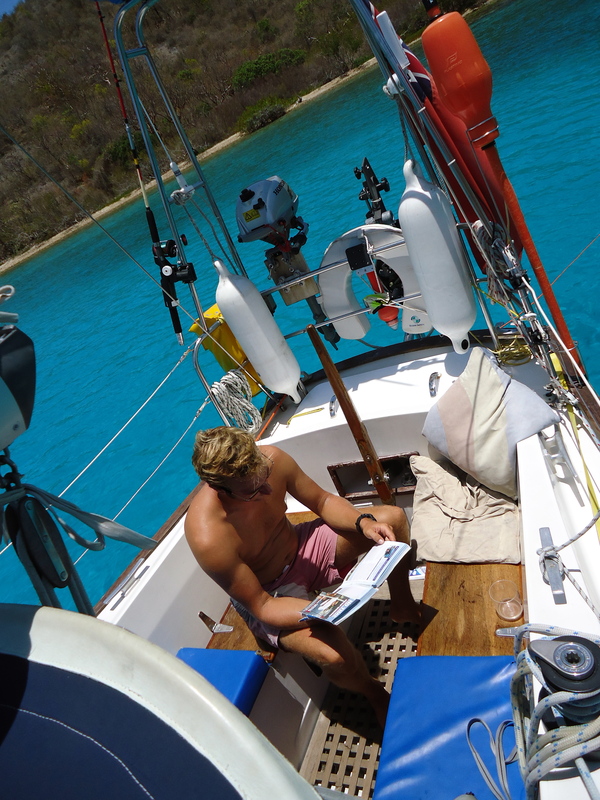 We had spent our first night in Jolly Harbour but after the costs we decided to move out after victualing the boat and making sure we were prepared for a long stint at anchor. 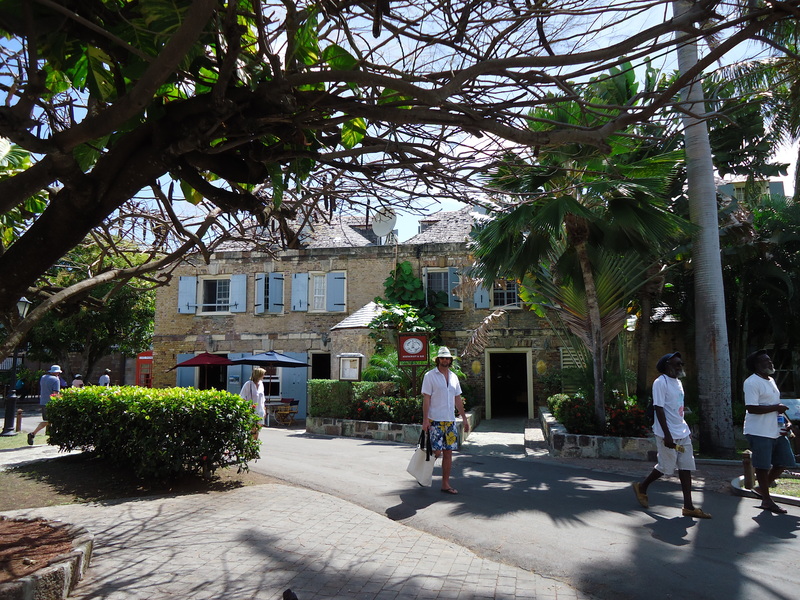 Jolly Harbour is a lovely place but more accustomed to Condos and hotel guests, it seemed to lack any real ‘feel’ or atmosphere. The lagoon and beach are great and the contrast in color from turquoise sea to clear blue sky; it is exactly what you would expect from a post card sent from paradise. We moved on to English Harbour the following day, unfortunately we had top head straight into the wind so for Nita and my Dad, their first sail was under motor beating into a 25 knot head wind for 12 miles. 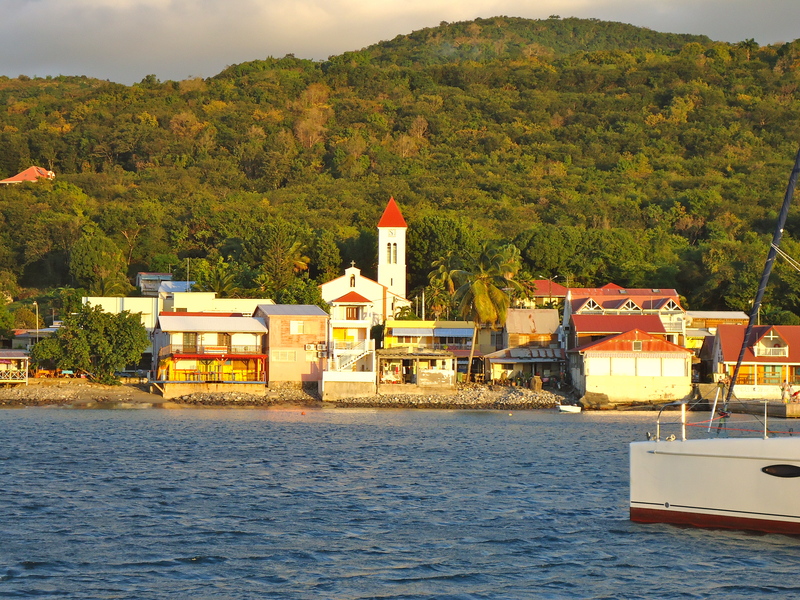 It states in our Pilot Book that English Harbour is one of the most beautiful harbour’s in the Caribbean; I have to disagree. He anchorage is crowded but sheltered. You do swing a lot on anchor so a stern anchor is useful but we did not use one throughout our stay their. 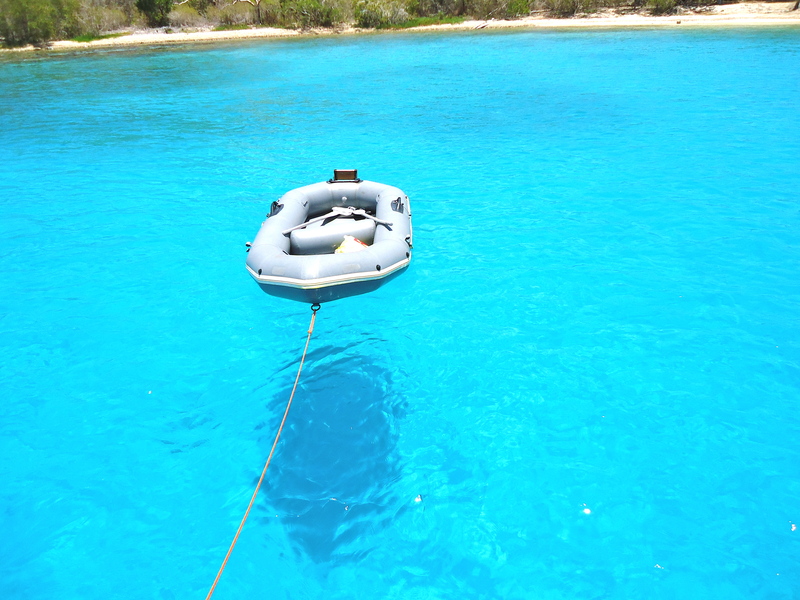 The water is not as clear as we have seen before but a guess we have been spoilt with St Lucia. Nelsons Dock Yard however is an experience. As you enter by way of dinghy it is similar to walking into a living museum. 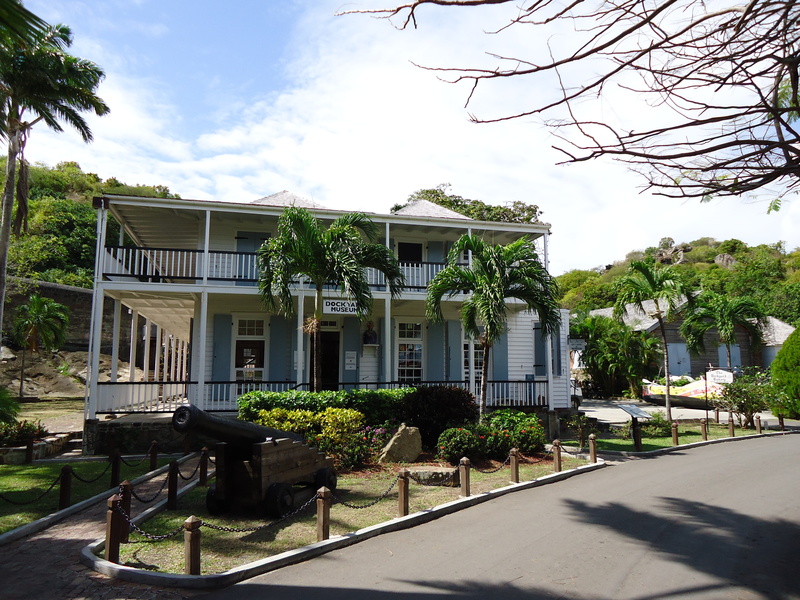 All the buildings have been tastefully restored and turned into gift shops, cafes and restaurants. 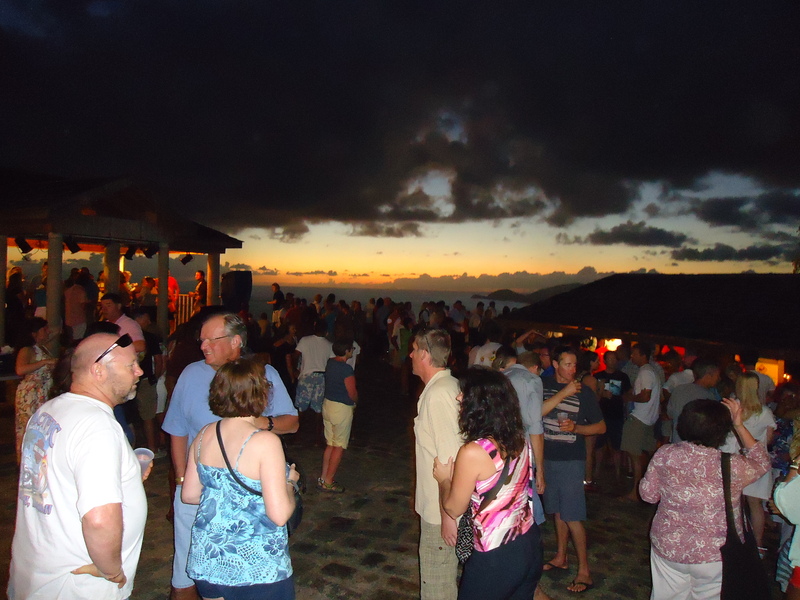 There was a lovely atmosphere in the evening and if you want more nightlife you can walk for 10 minutes into Falmouth Harbour. One evening we went to Shirley Heights with another couple from Golden Fleece. Shirley Heights hold a magnificent party on Sunday Nights. You have to hike up what feels like a mountain to get to it but it is worth it. They start the party at 16:00 and carry on through the night. There was an amazing atmosphere with near enough 400 people there. 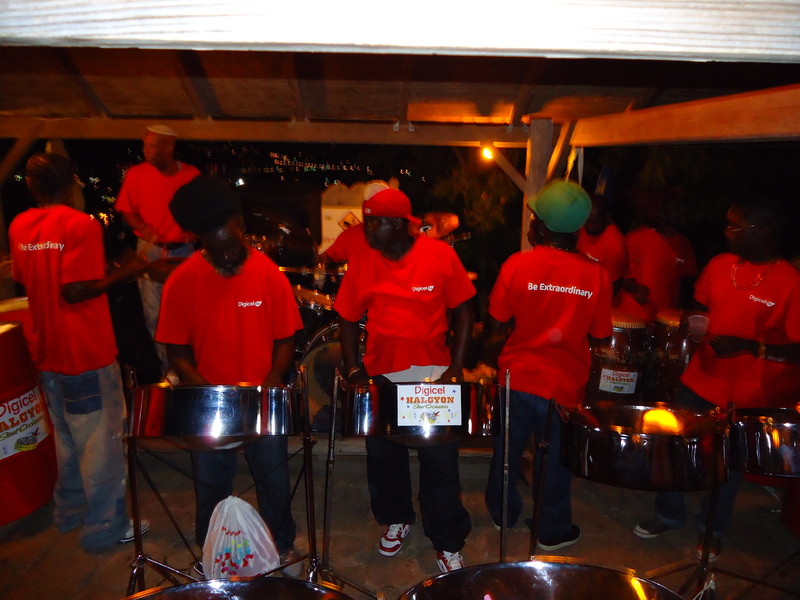 We were completely astounded by the steel drum band they had playing, their talent is incredible. If you are ever in Antigua make sure you take part in this party; it is a must. We will certainly pay another visit on our way down and make sure we there earlier to take better photos of the sunset. 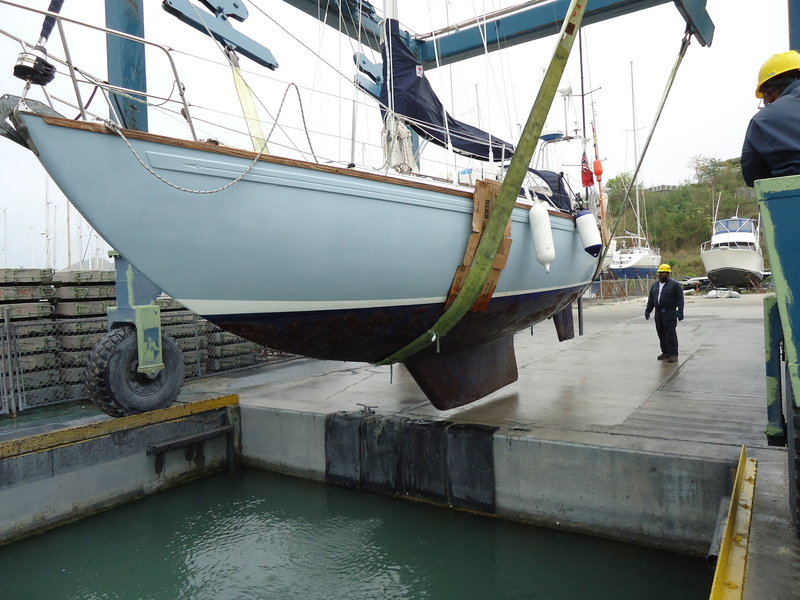 After a short period we decided to head to Falmouth Harbour. The decision was made after nearly colliding with another boat on anchor so we made a quick escape before any damage could occur. 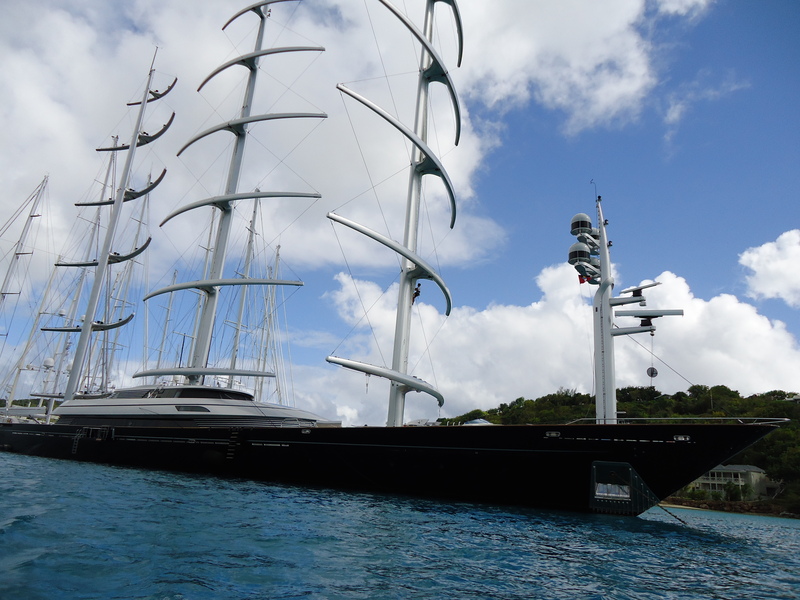 The great thing about our anchorage in Falmouth Harbour was in our proximity to the Maltese Falcon. The Maltese Falcon is, I believe the largest and most technolically advanced Super Yacht in the world and we were a stones throw away from it. I had studied this yacht when it has been built a few years early and could not believe we were now anchored so close to it. There is not too much to see in Falmouth but there is a good atmosphere mainly due to tourists and Super Yacht Crew. We had a brief look around before heading back to the boat and watching some dinghy racing. 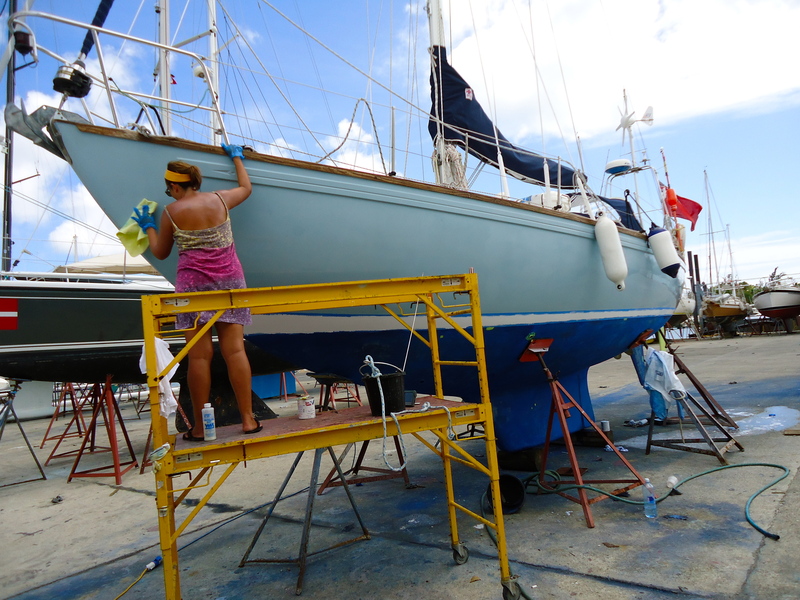 As we were heading to the islands of Nevis and St Kitt’s the following day we decided to return to Jolly Harbour to stock up on food, fuel and water, which took most of the day to complete. 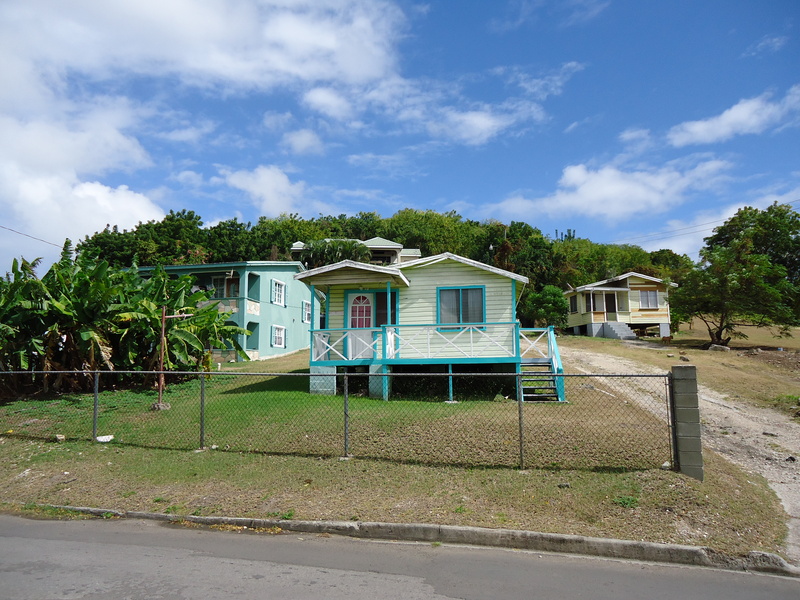 The good thing about checking out in Jolly Harbour is that you don’t seem to have to pay for your check-out or for garbage disposal. 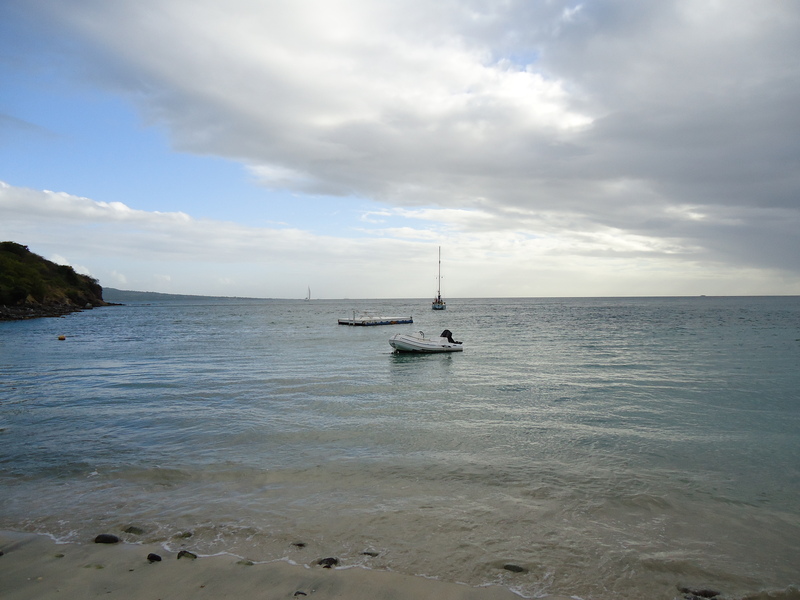 It has been so difficult to leave Marigot Bay. We had been planning to depart for some time as my Dad is arriving shortly and we need to get to Antigua before the 06th February. Anyway we were invited to a fantastic Bar-B-Q hosted by one of the Super Yachts. I have never tasted steak and Chicken as good as that evening. We were also joined by many friends we had come to know, which only made it harder to depart but there is plenty more to see and our paths will cross again in the not too distant future. 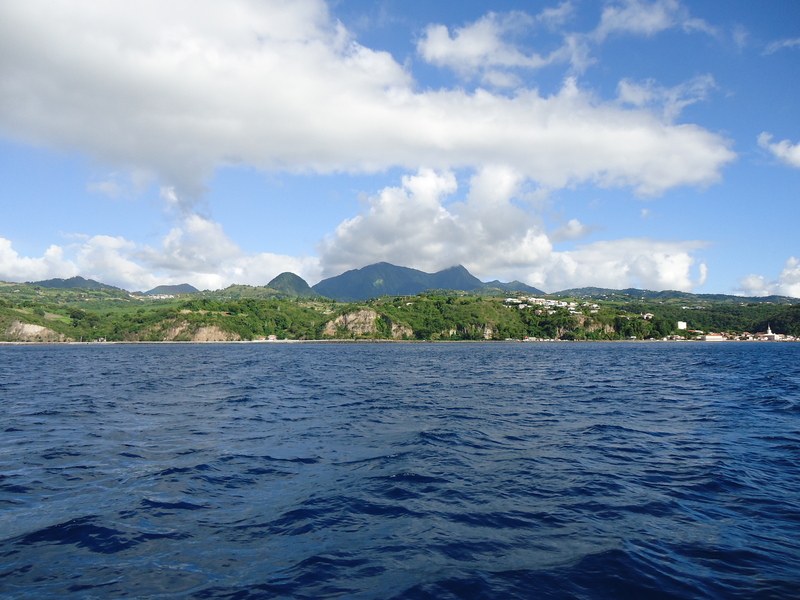 We departed Marigot Bay early on the 31st. 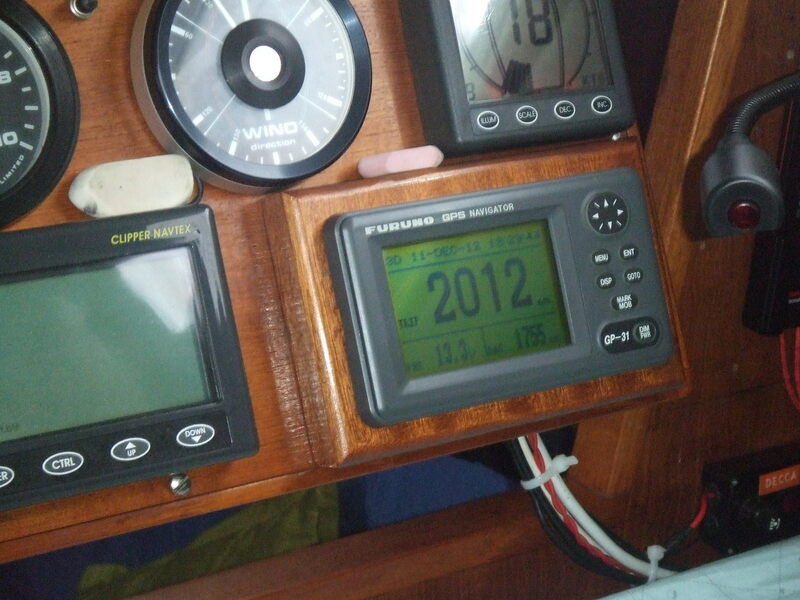 We hit a 20 knot wind on the nose as soon as we left and had an absolutely awful 3 hours just to cover 9 miles. 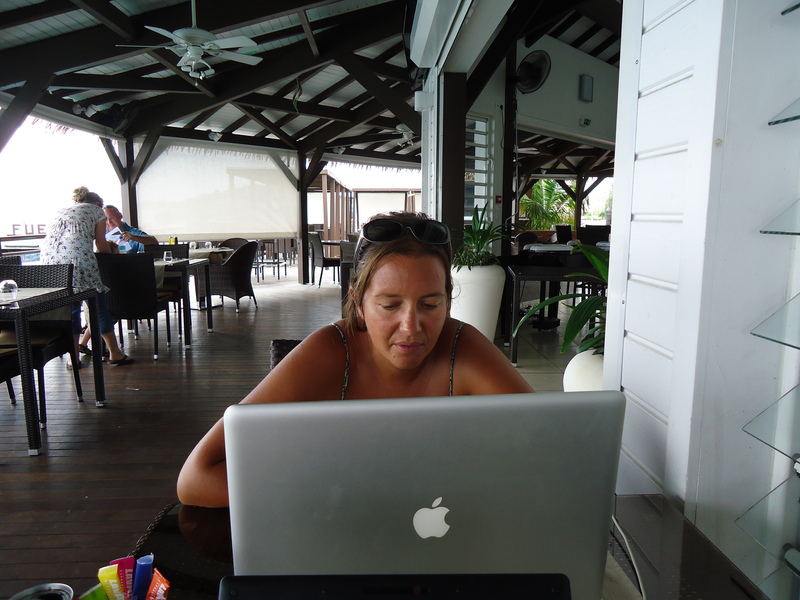 We had to pull into Rodney Bay to sort out an issue we had with our newly purchased camera. 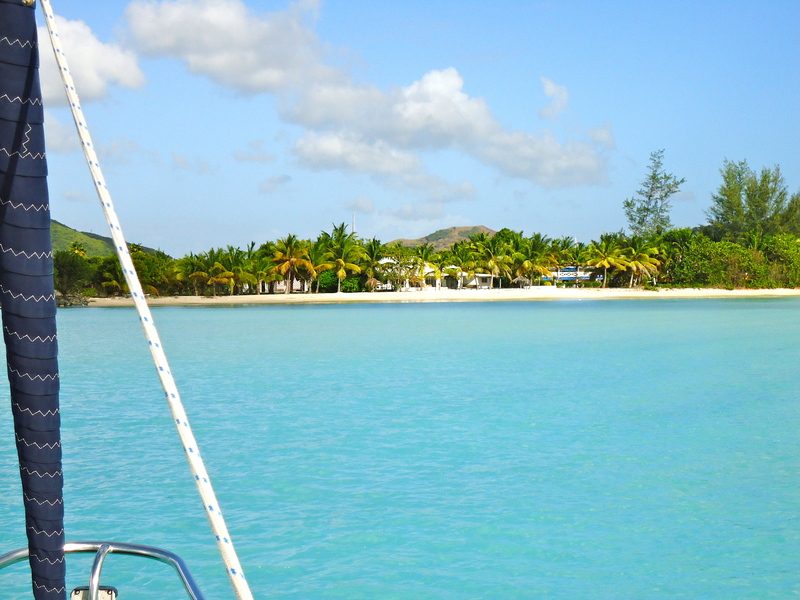 The idea was to head on to Martinique but after the disaster coming up to Rodney we decided to pick up a mooring in the Lagoon. 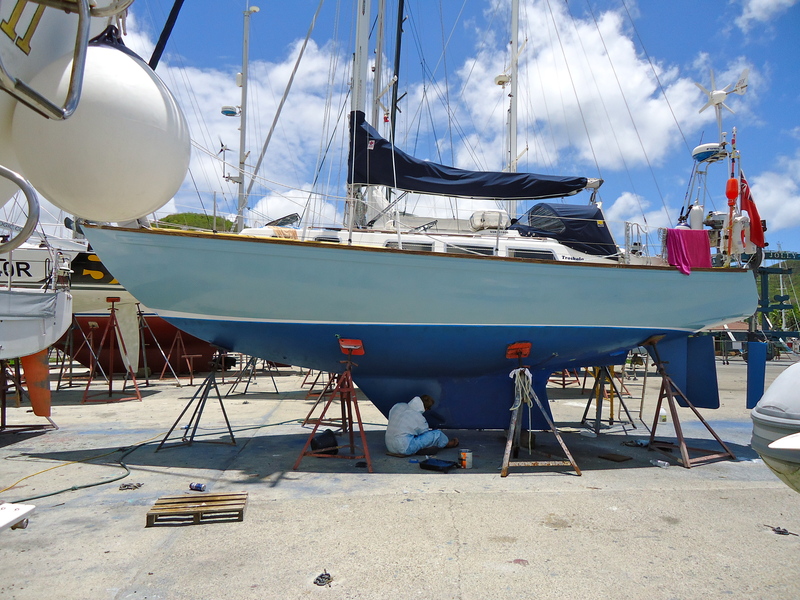 We were only meant to stay in Rodney Bay for one night but three nights later we were still there with 25-30 knot winds blowing outside the harbor. There was not a chance in the world to leave, which has not put pressure on us to make the leg to Antigua. 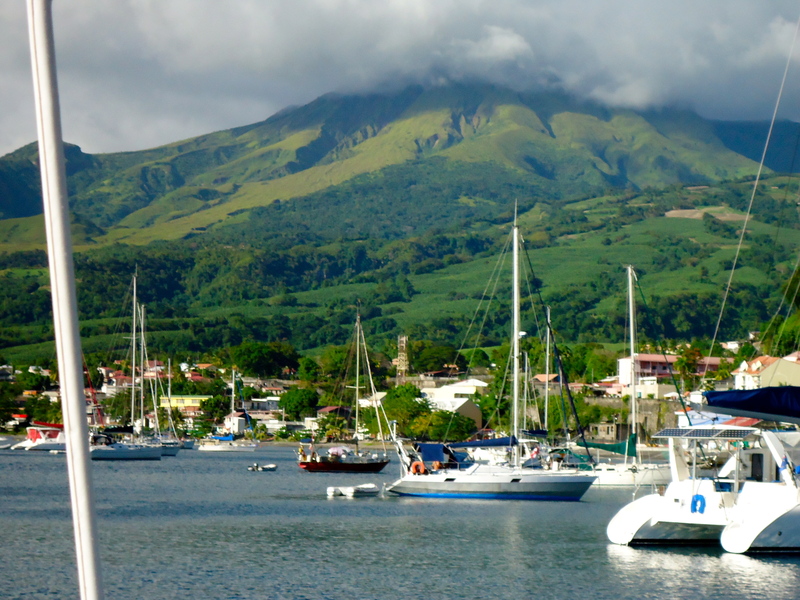 It is a shame we cannot give you more information on Martinique, Dominica and Guadeloupe. We had to race up north but did manage to stay in each island but did not clear customs, as we had to leave the following morning. We had a good passage to Martinique. I don’t know who said that the Caribbean is all plain sailing; as soon as you leave the Lee of the Island you are battered by swell, current and strong winds and then when you are in the Lee of the next island you are constantly changing sail as the wind scoops around the bottom and then surprises you by going from 5 knots to 30 knots the other side of a mountain. 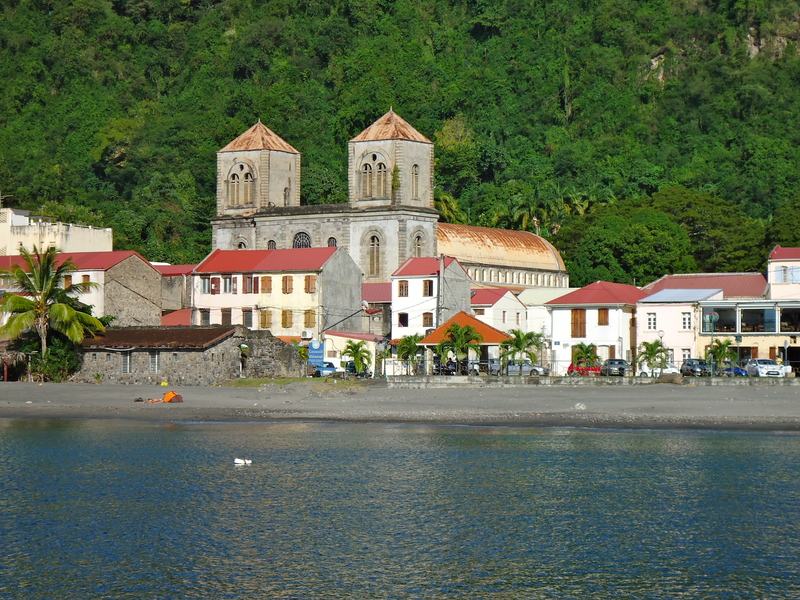 We headed to the north of Martinique to San Pierre. What a surprise, we decided to take a quick trip ashore and found it to be a lot more European than we had expected. As this is a French Island there were more expensive cars (Renaults, BMW’s etc.) We took a walk to an old theatre that was destroyed in the 19th century by a hurricane and a prison. 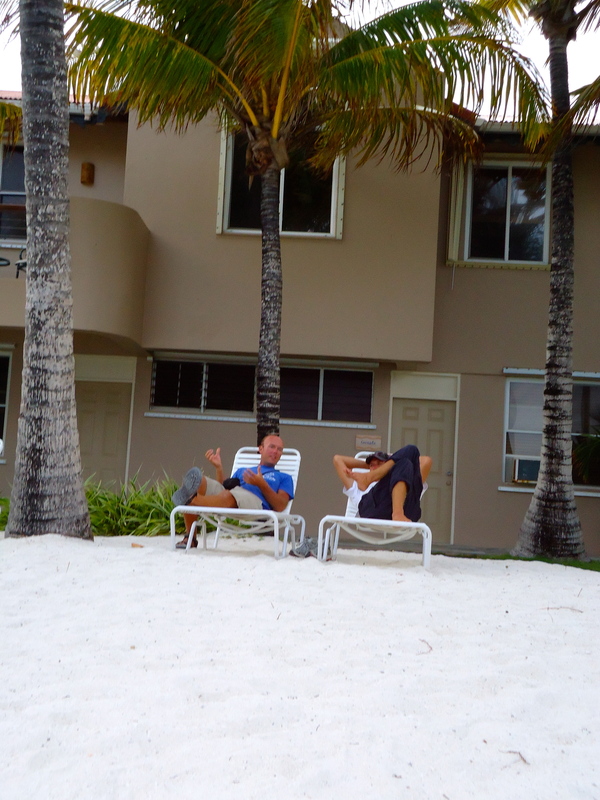 It is a shame we could not stay longer but the contrast from St Lucia was refreshing. The buildings were not well cared for but the people were very friendly and it did have an atmosphere that was very European compared to what we had been used too. 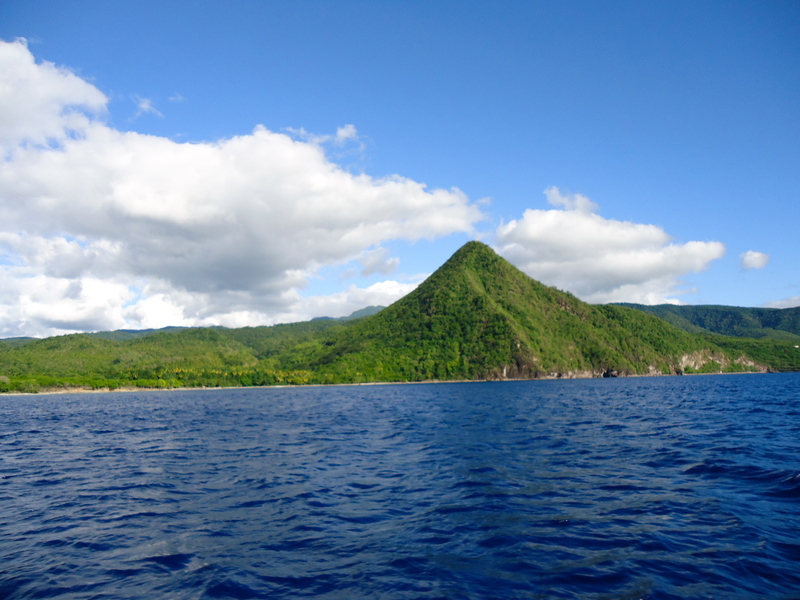 Dominica is a stunning island when seen from land. Apparently when Columbus was trying to describe this island to the Queen of Spain he scrunched up a piece of paper and showed her the likeness. 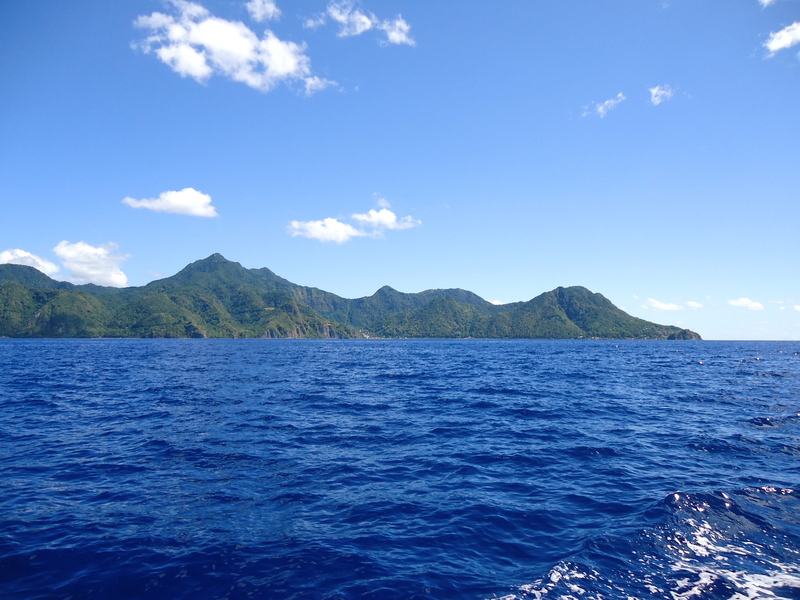 Dominica is so green especially when seen from a very blue sea, the mountains and valleys are very distinctive. We had the same issues with forever changing winds and gusts that knocked Troskala about a bit but all in all it was a pretty uneventful sail but the scenery was stunning. We decided to anchor in Rupert Bay, which was a fantastic spot. 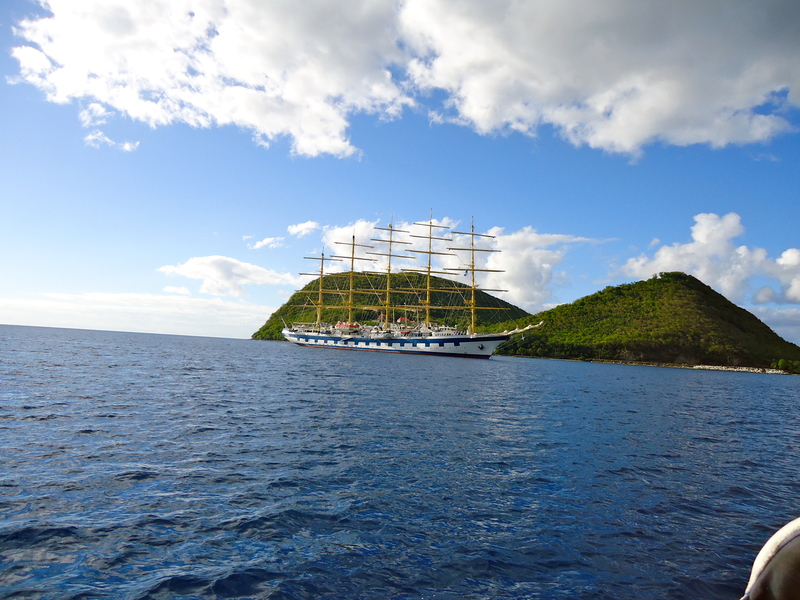 We sailed past the Star clipper (pictured below) and settled ourselves in 2 meters of water by the beach. Again we had not the time to clear customs so decided to go for a swim and have an early dinner before heading to bed. We will certainly re-visit Rupert Bay, the scenery surrounding us was quite spectacular and the stillness and quietness of the place is also to be noted as most popular anchorages have beach bars playing music all night. 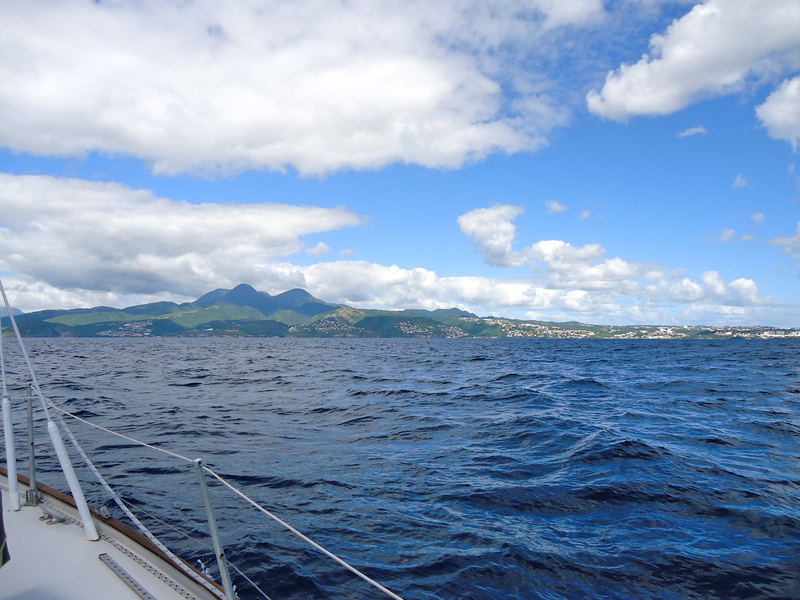 We departed Rupert Bay at 07:00 and started our journey that would take us to the north of Guadeloupe to Deshaies. 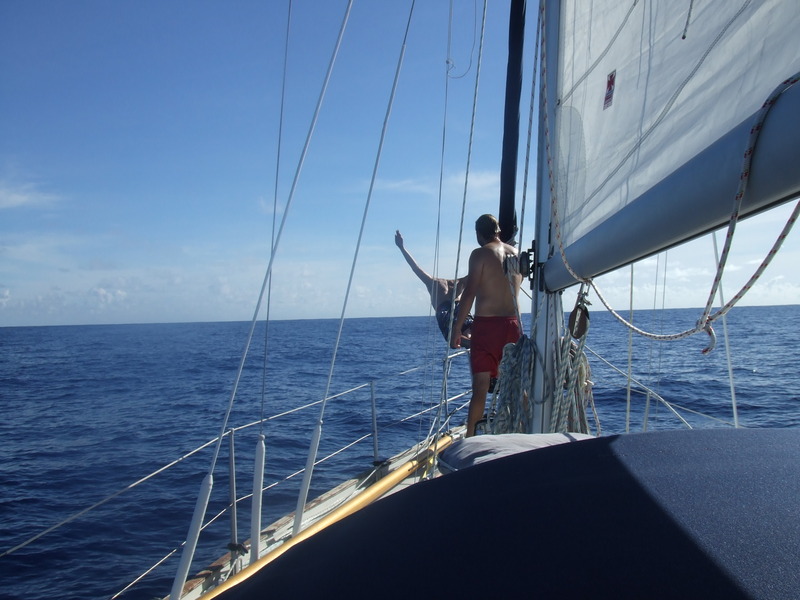 We had a great crossing from Dominica to Guadeloupe with calm seas and a good breeze, the fun started when we rounded Guadeloupe with erratic winds and stupid calms, there was just no point in doing anything with the sails. We lost our new caps that were given to us by a good friend, my cap actually flew before landing what seemed to be half a mile away – it could not be rescued. Carlotta lost hers shortly afterwards; we tried to rescue this one but to no avail. 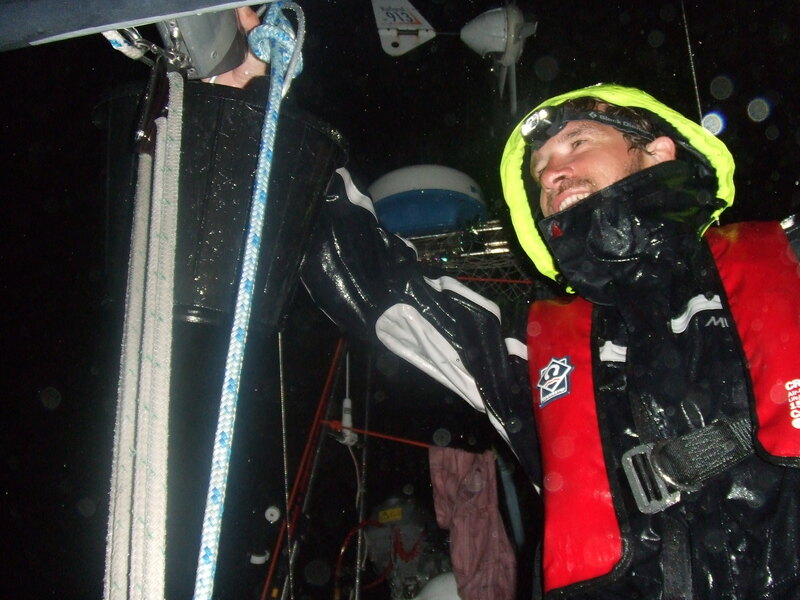 We were now in a force 7, we took the main down and used genoa, which seemed to work very well with little weather helm as we had previously experienced. It has to be noted that it was not since the north of Spain that we were sailing close-hauled and you tend to forget what works and what does not. 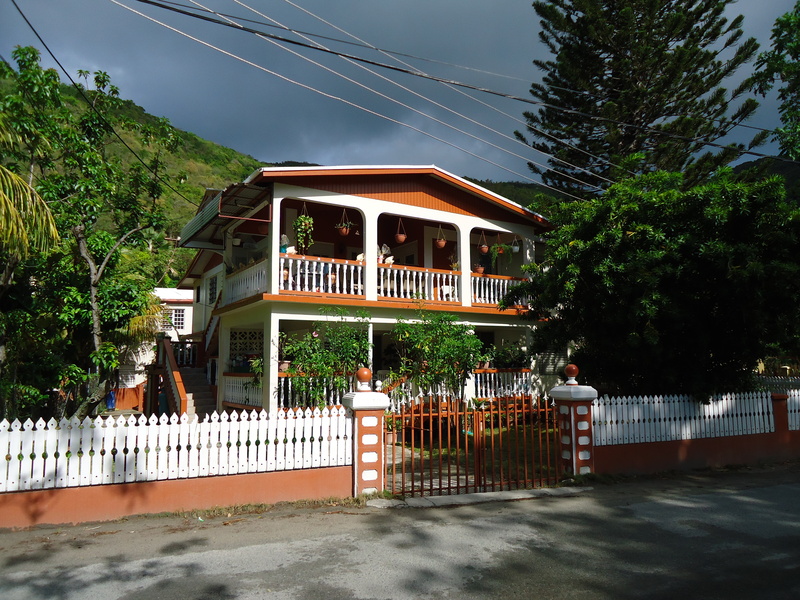 Anyway we finally arrived in Deshaies feeling tired and battered. 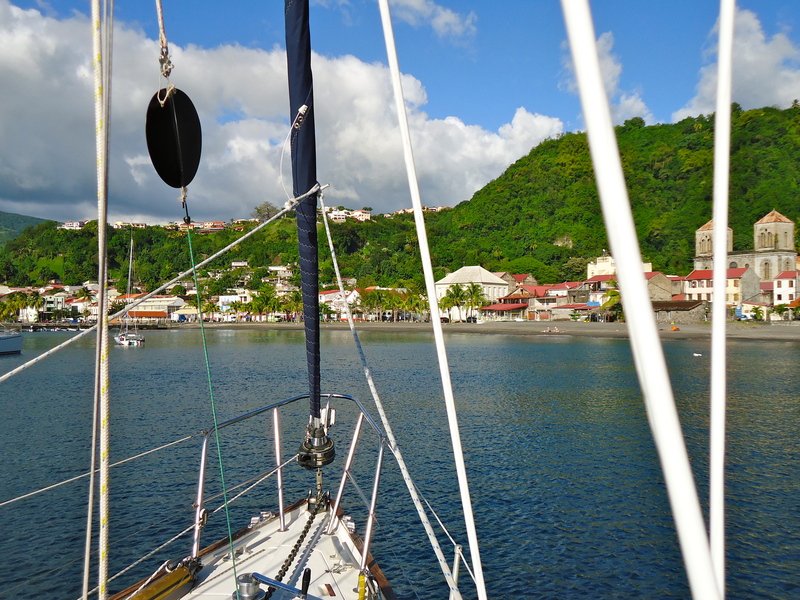 Deshaies has to be the windiest anchorage I have ever been in. The books say that Guadeloupe is a wind scoop and that Deshaies is a vent; yes, it is. 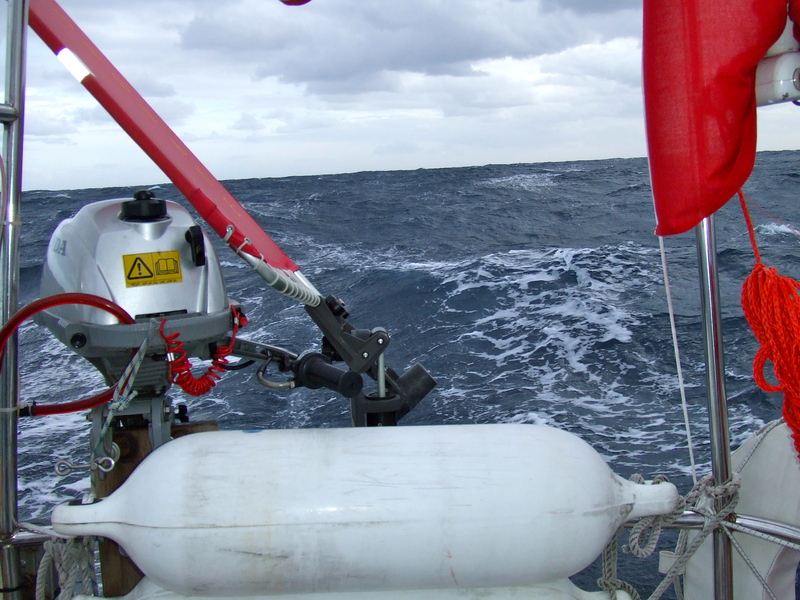 It was blowing a lovely force 7 through the night but we had held well and were close enough to the shore not to have anyone in front of us dragging into us. We decided total e a visit into town and we are both glad we took this opportunity to experience and fantastic little place. 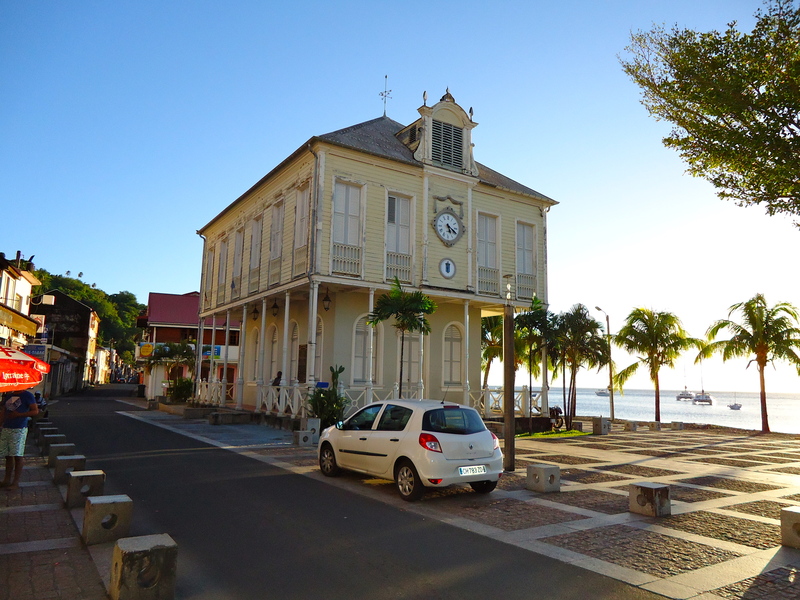 We thought that San Pierre was European; Deshaies is a mini French town. It has a lovely main street with bars, bakery, and general store; it even had a Spar convenience store so we took the opportunity to stock up on Pate, wine and other nibbles that we have been so long without. 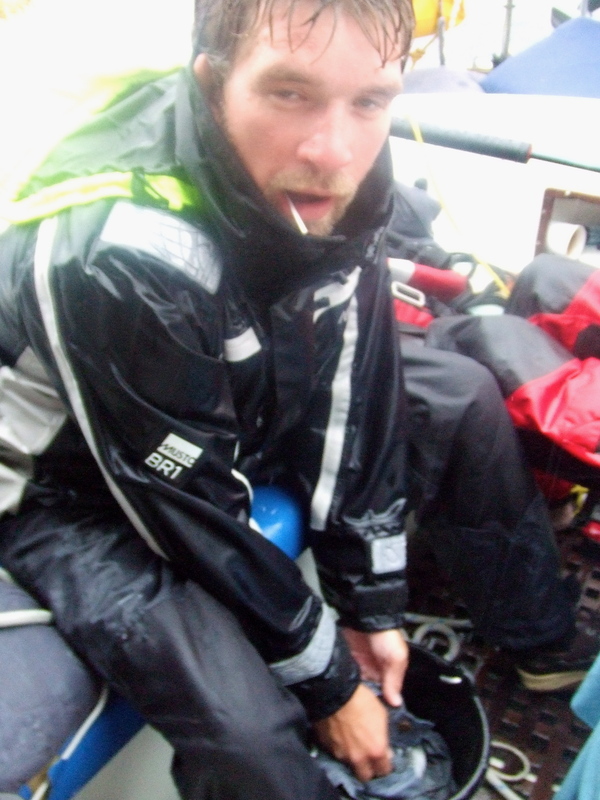 We had beer whilst the wind howled and then rowed back to Troskala for yet another early night. 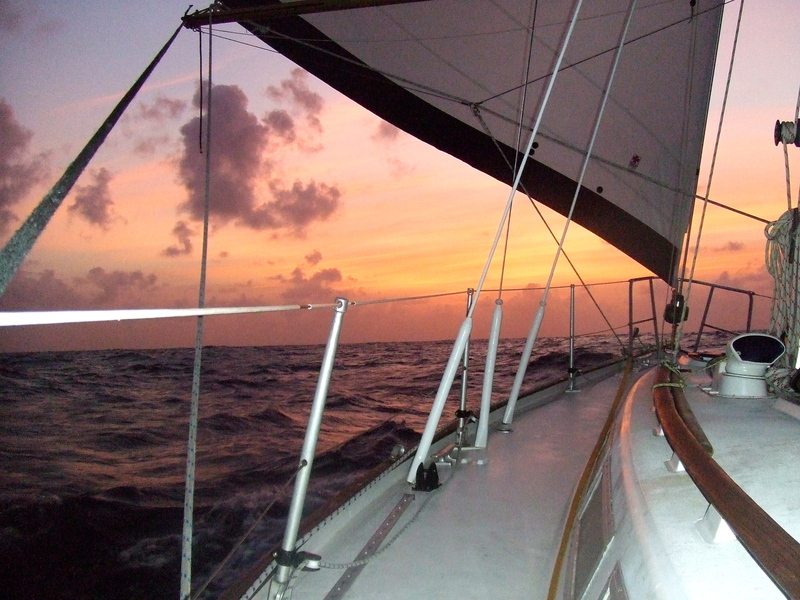 We now have our last leg on the journey to Antigua. 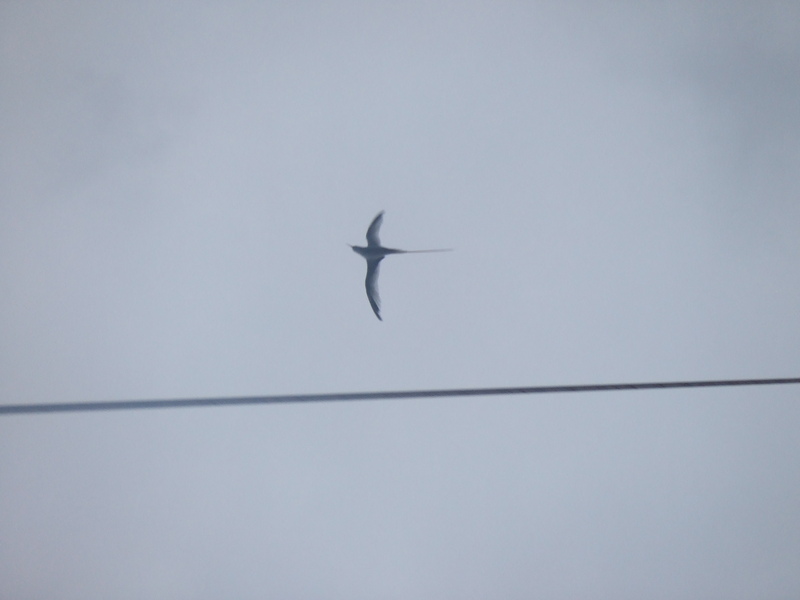 As mentioned previously it is a shame we have not really spent enough time in the islands between St Lucia and Antigua but we will re-visit these wither this year or next. 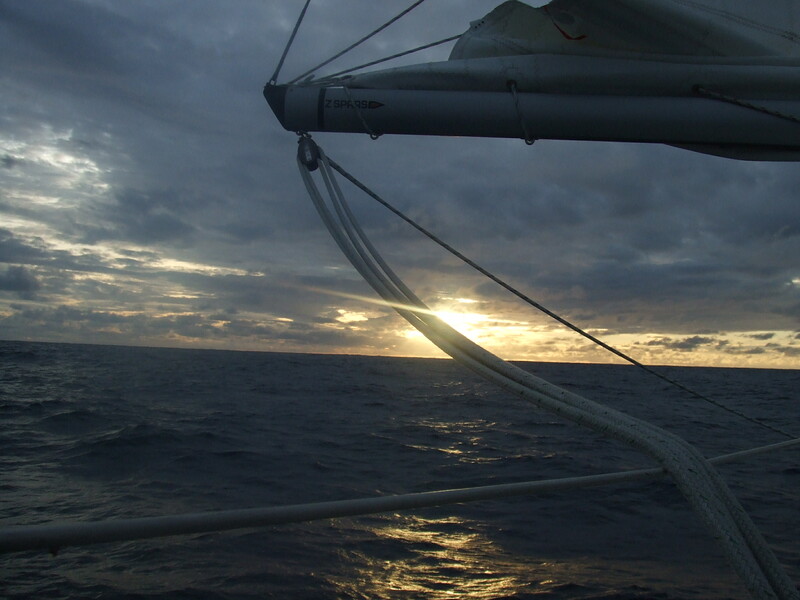 We departed Deshaies at 06:30; we would have wanted to depart earlier but due to the wind and the amount of other boats in the anchorage we thought it would be wise to wait for daylight. My Dad and Nita would arrive at 16:00 local time and we still had 48 miles to complete to reach Jolly Harbor. 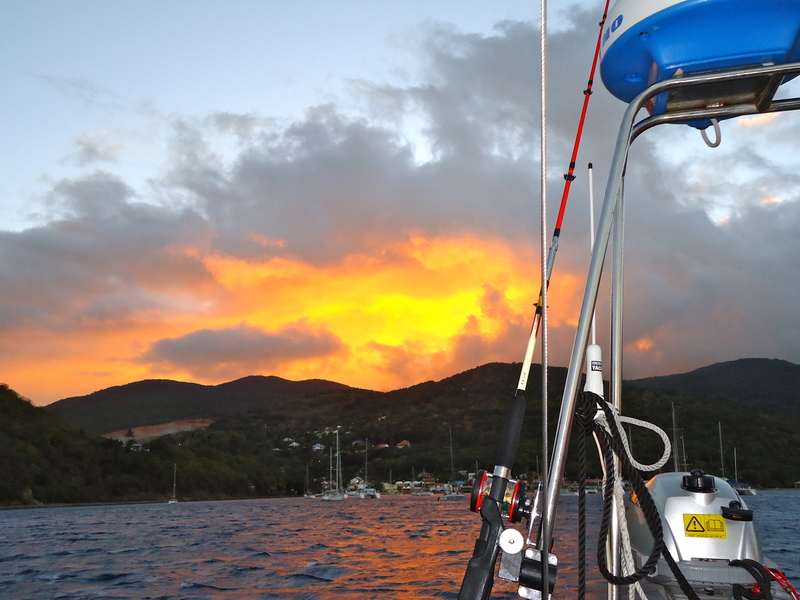 We left Deshaies with an amazing sunrise that appeared to set the sky on fire; it was an unbelievable sight and I doubt any photo can capture the scene. 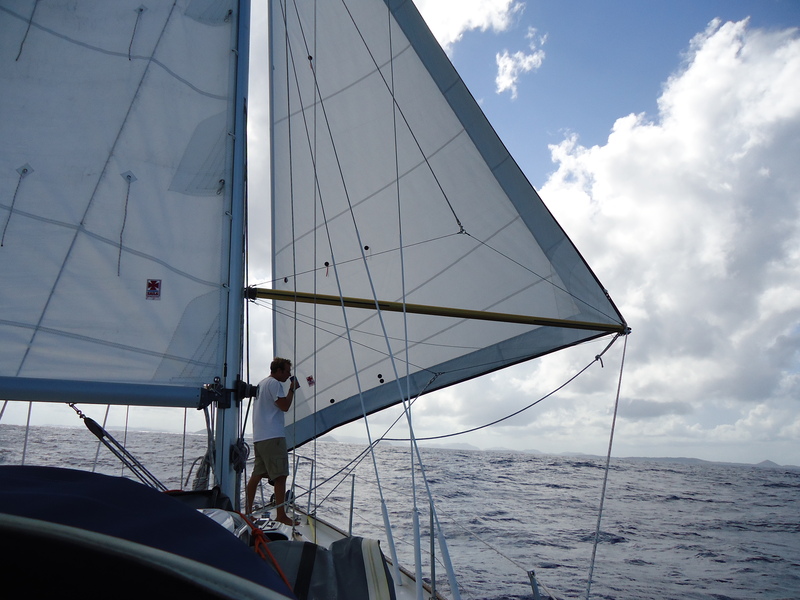 We had very little wind and had to motor sail for most of the journey just to keep 5 knots over ground. 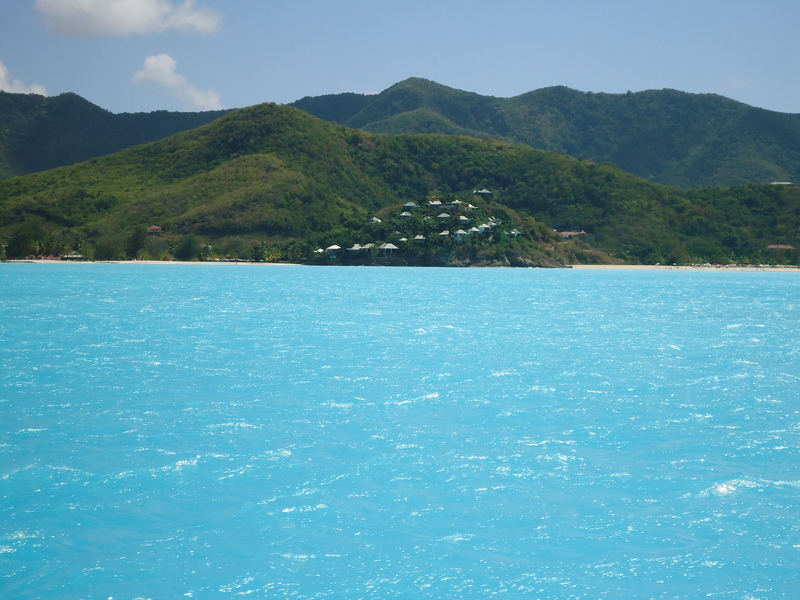 Nothing really prepared us for the color of the water we saw on approaching Antigua. 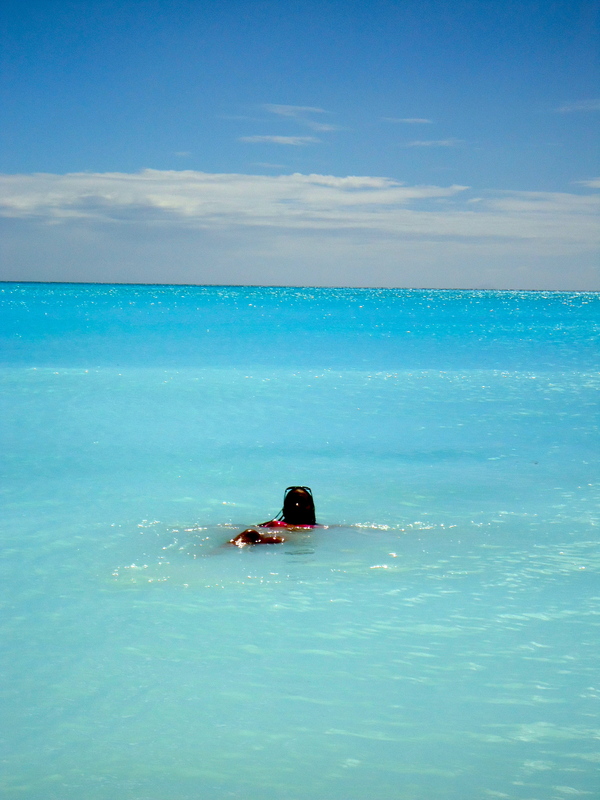 Just as we were 3 miles south of Jolly Harbor entrance the water turned from a dark blue to a vivid turquoise, it was unbelievable. 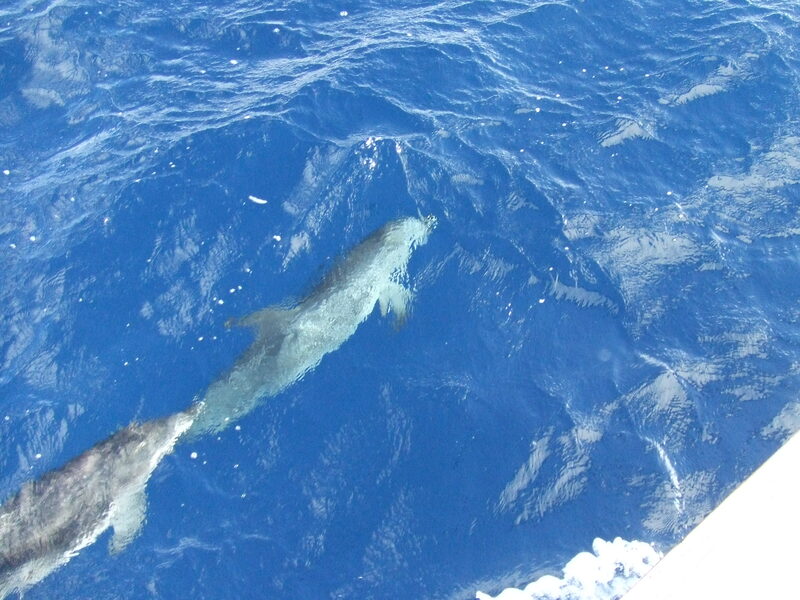 We can see coral only 3 meters under the keel with amazing contrasts; Carlotta was very excited and had finally seen her true paradise with golden beaches to our starboard, lush green hills ahead and this amazing water. 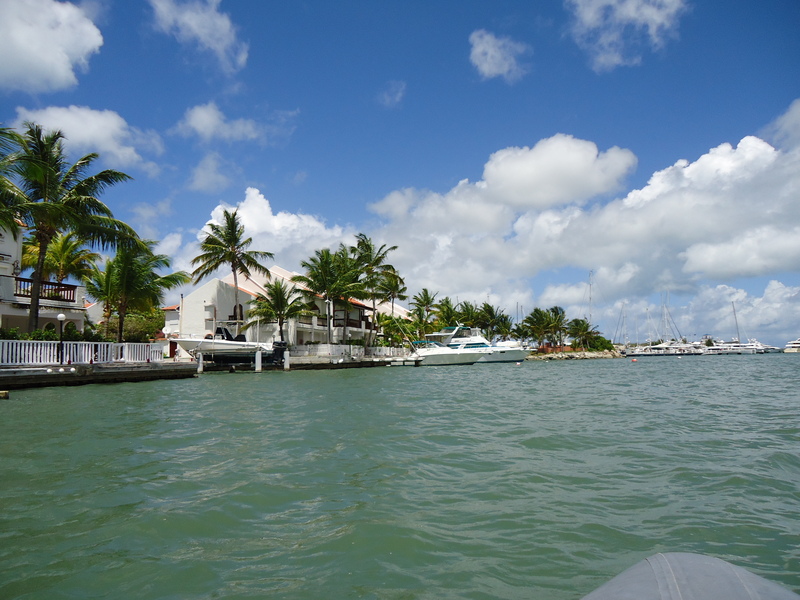 We checked into Jolly Harbor and were escorted to the main marina. Now, unless you are filthy rich do not stay in Jolly Harbor Marina. For Troskala we were charged £60 a night, yes, £60 GBP per night. The facilities were not great and I still cannot get over the fact that this marina is more expensive than any we have come across since London, even Cowes Yacht Haven charged less. Anyway, we were there for a purpose and the purpose is to collect my Dad and Nita for the next voyage north to the British Virgin Islands and beyond. 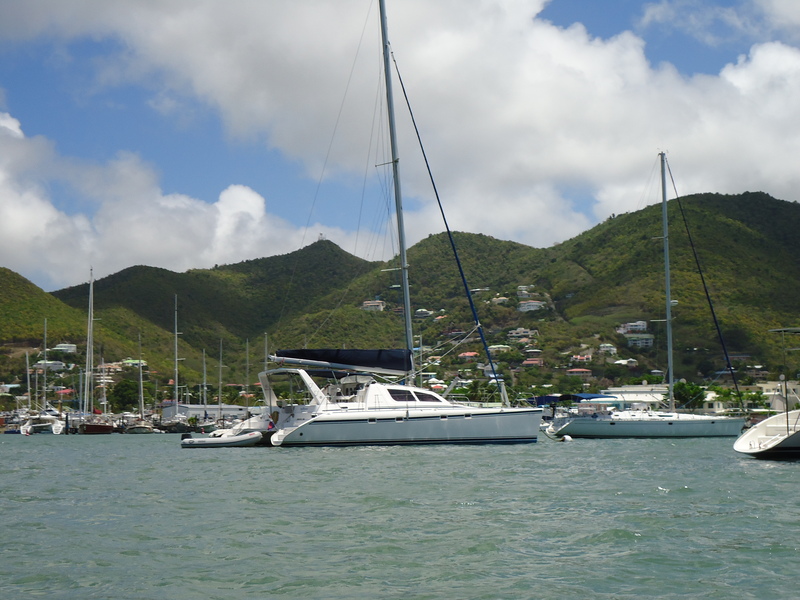 Nita and my Dad will be crewing for us for one month before we then head back to Antigua. 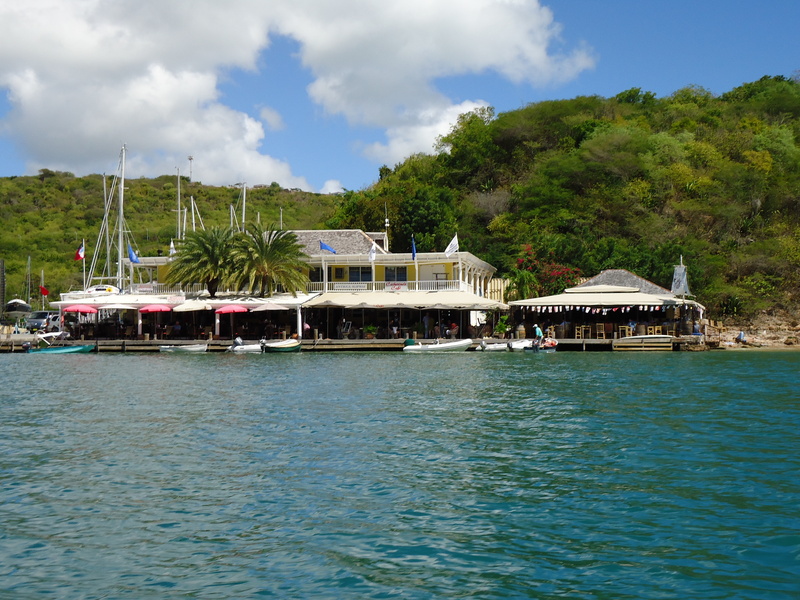 We moved on to the anchorage the second night of being in Antigua just to save on costs. It dod not matter as Carlotta was in her element with the paradise she found herself in. When you wake up in the morning and cannot believe your eyes when looking out of the hatch it takes some beating. We all went for a trip to the supermarket in the morning to victual the boat before the next passage. 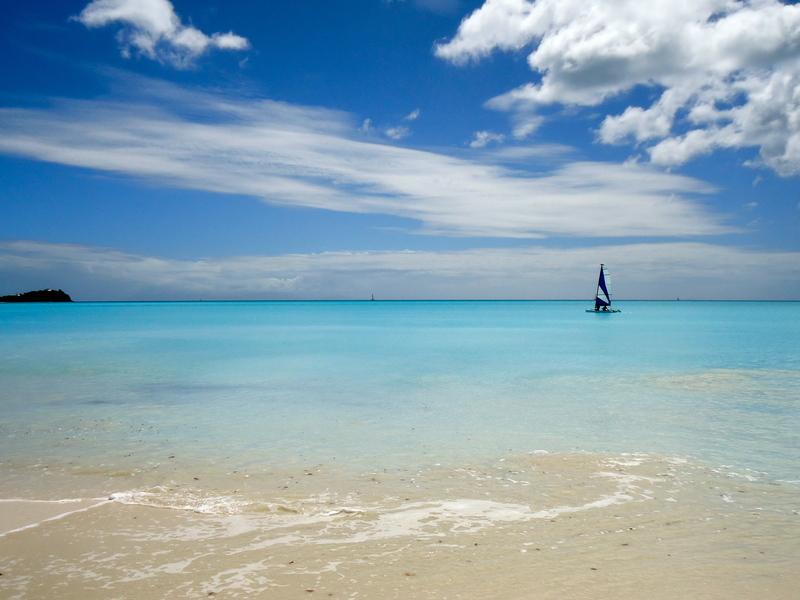 We found time for a swim in the milky waters on Jolly Harbor and then set sail to English Harbor. 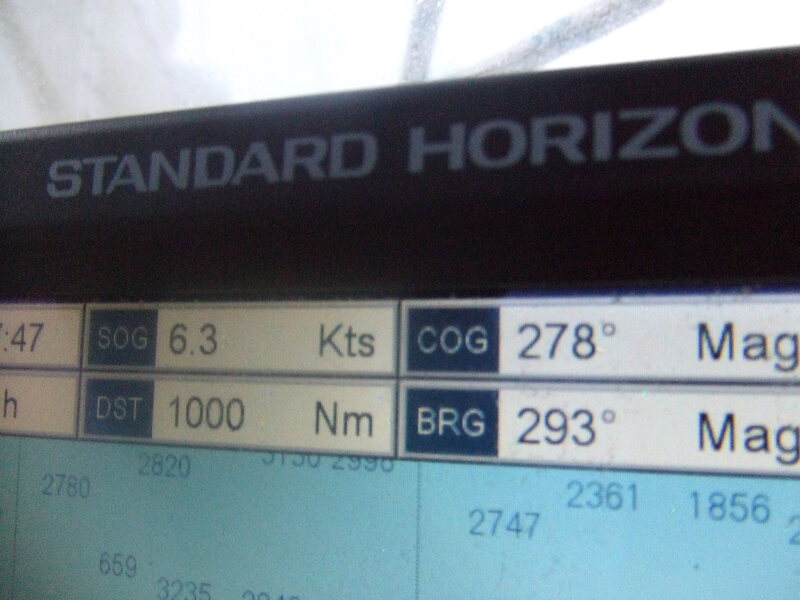 Unfortunately our sailing was cut short when we had to turn East into 25 knots of wind and having to motor 7 miles at an average of 3.8 knots. We eventually arrived into the historic English Harbor and anchored in Freemans Bay, which is busy. 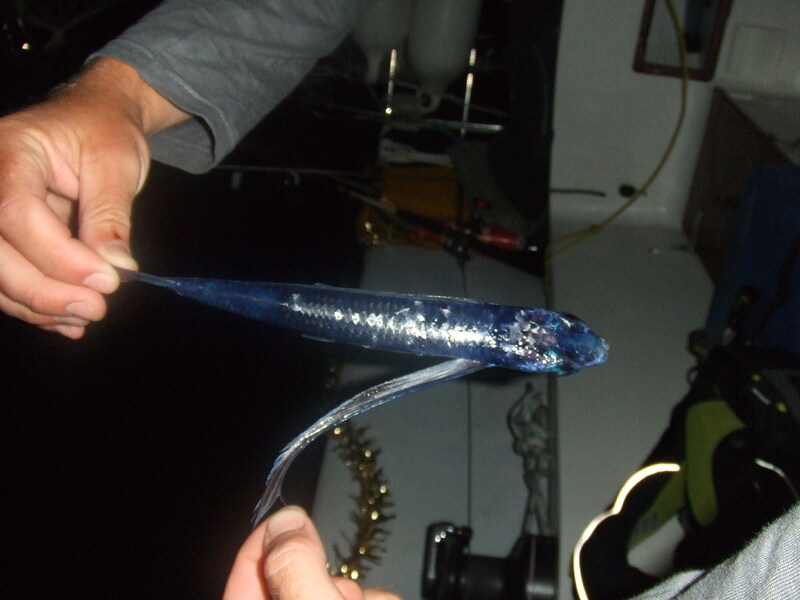 We had a few attempts at anchoring and finally managed to find a space near the main channel. 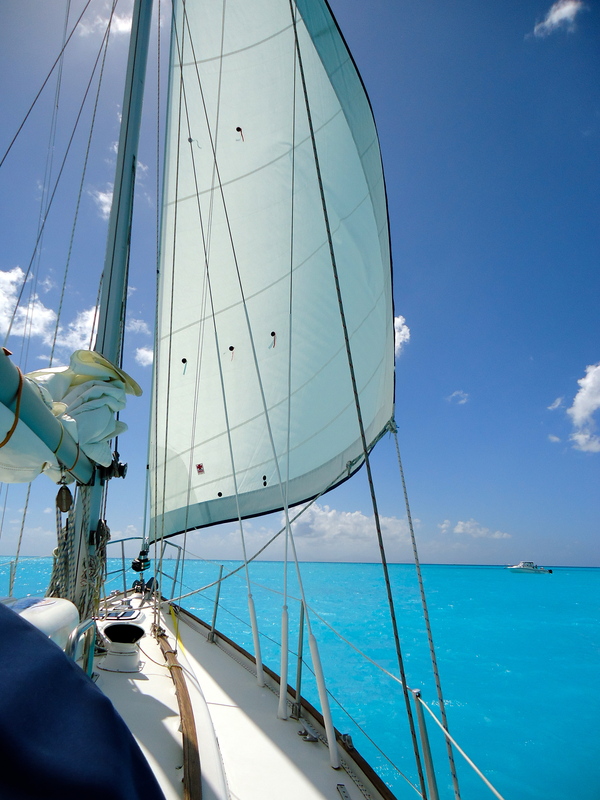 We sailed down from Rodney Bay a few days ago and I will post that trip shortly. It is the first time we have ever been able to see our anchor at the bottom let alone swim down to it to make sure it had held. if the rest of the caribbean is like this it will be an amazing place. 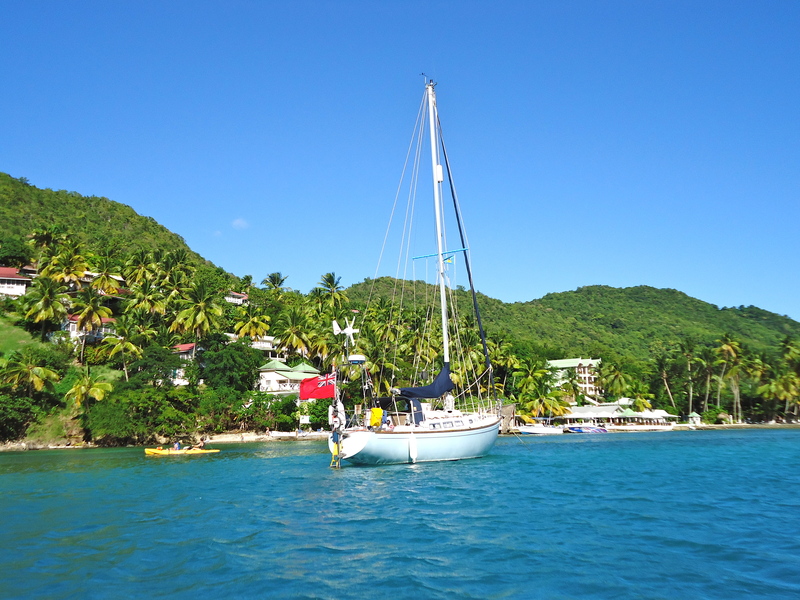 We will set sail on Monday heading to Bequia and the Grenadines before then heading back to St Lucia to meet friends and then on to Antigua for February. 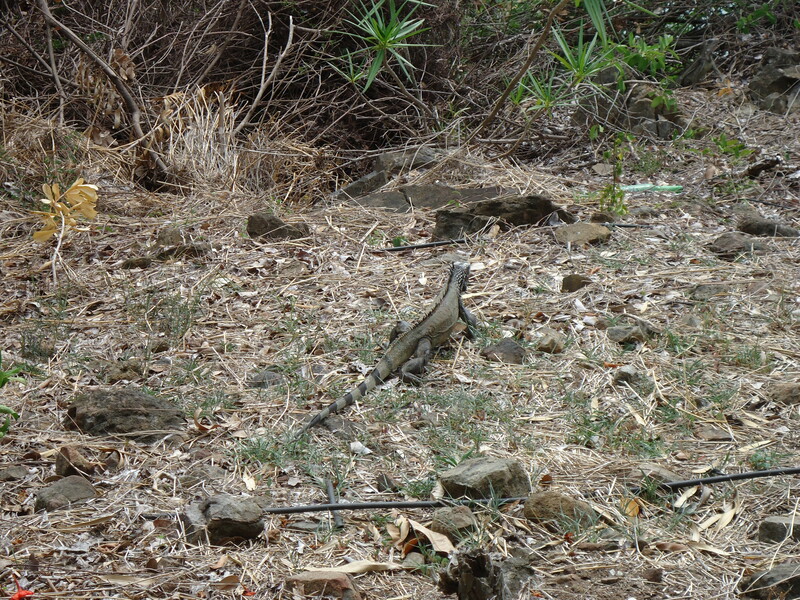 I hope you all have a great weekend and I will send another post shorty highlighting our time so far in St Lucia.